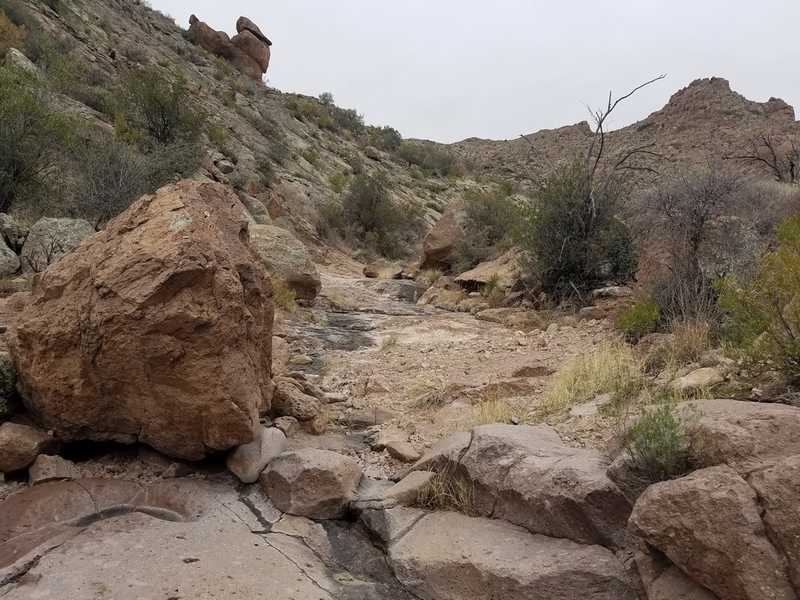 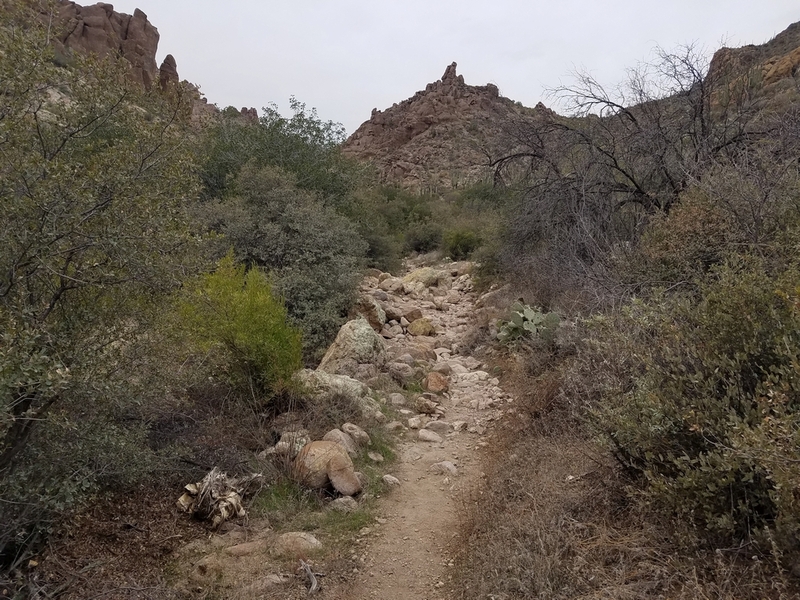 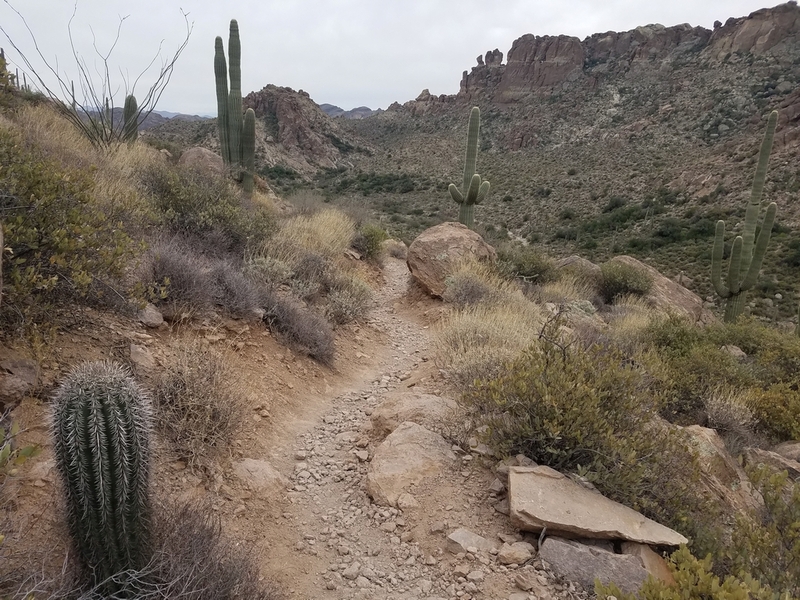 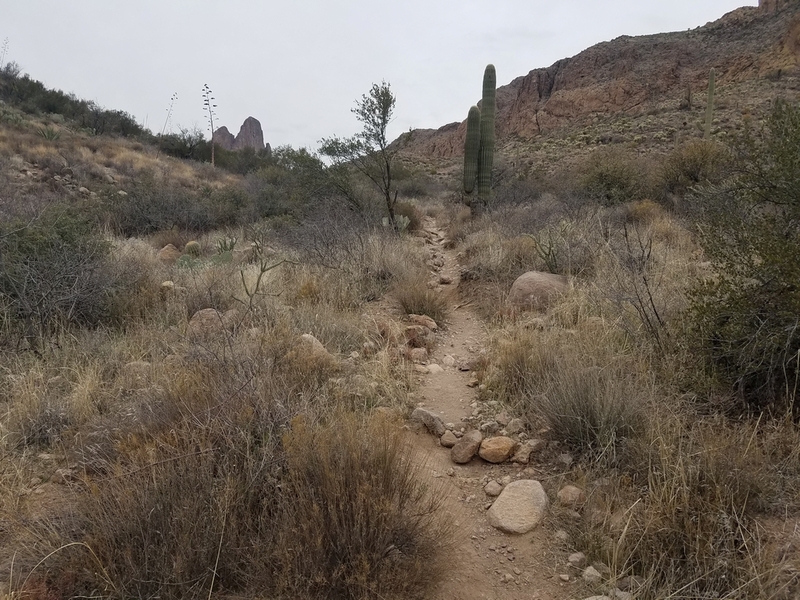 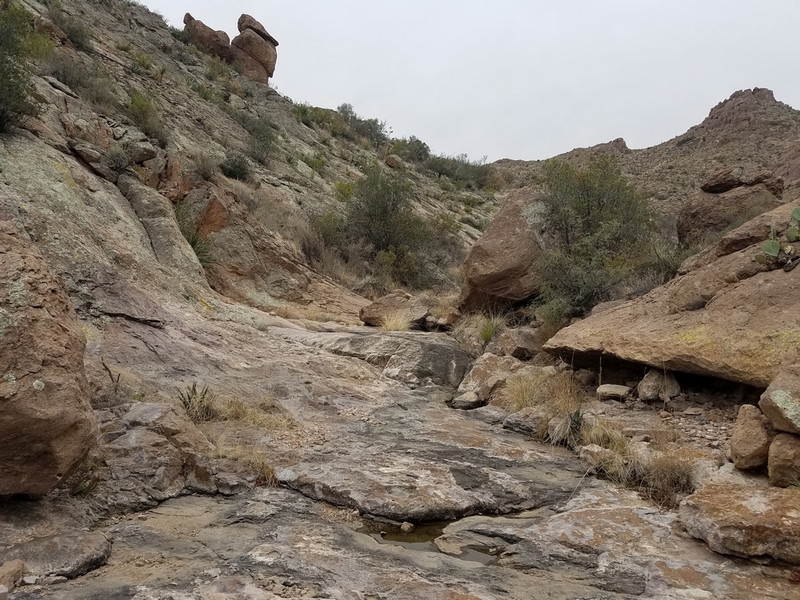 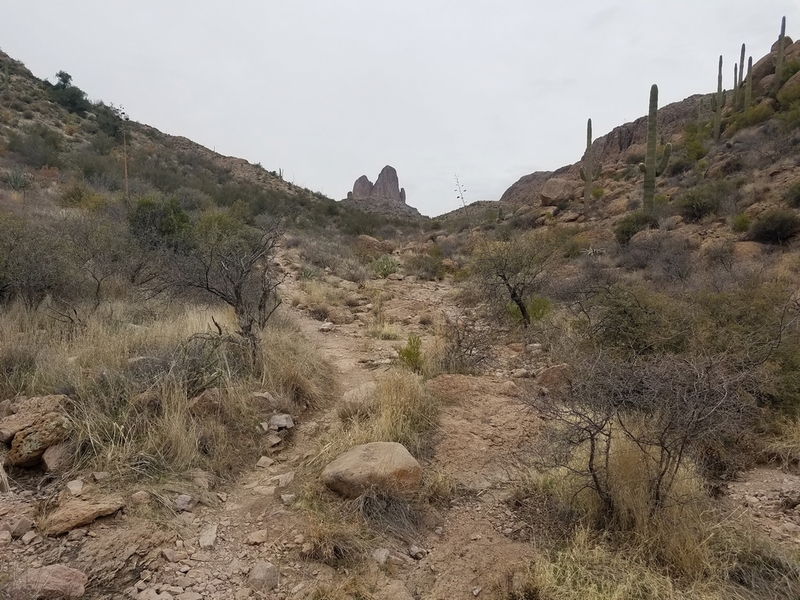 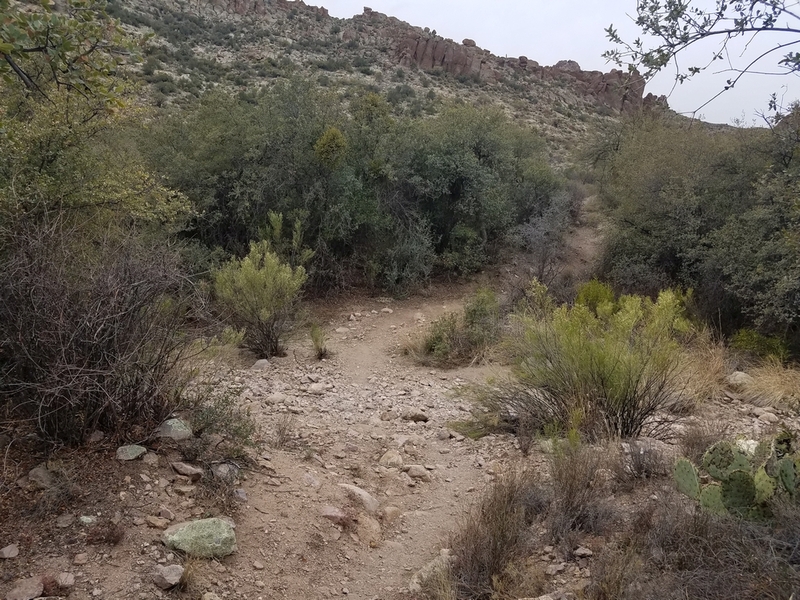 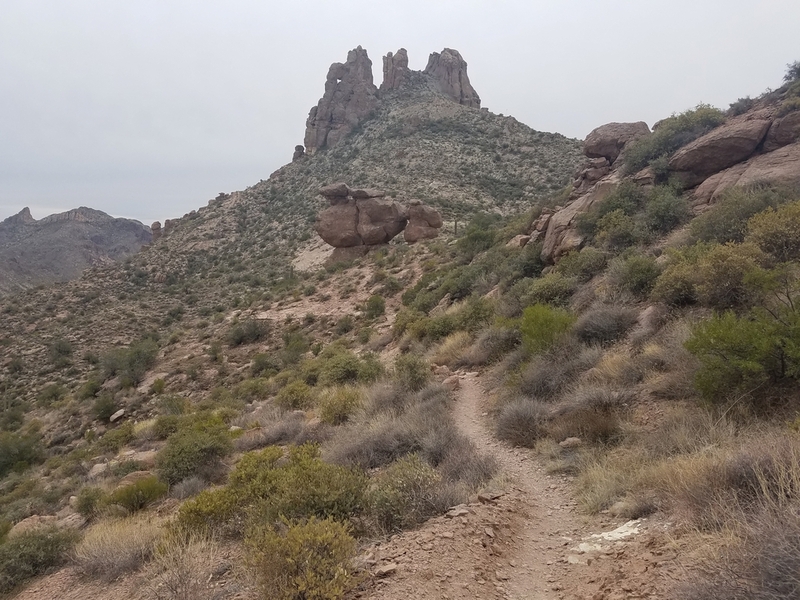 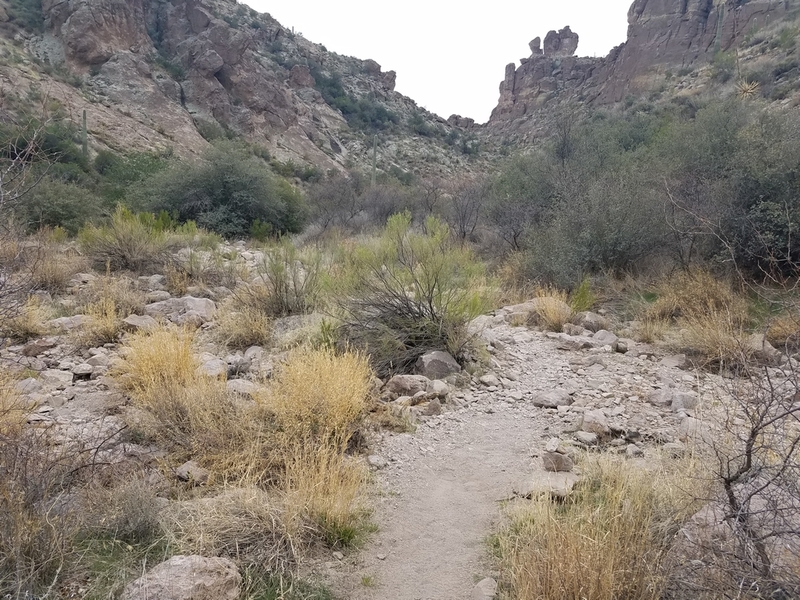 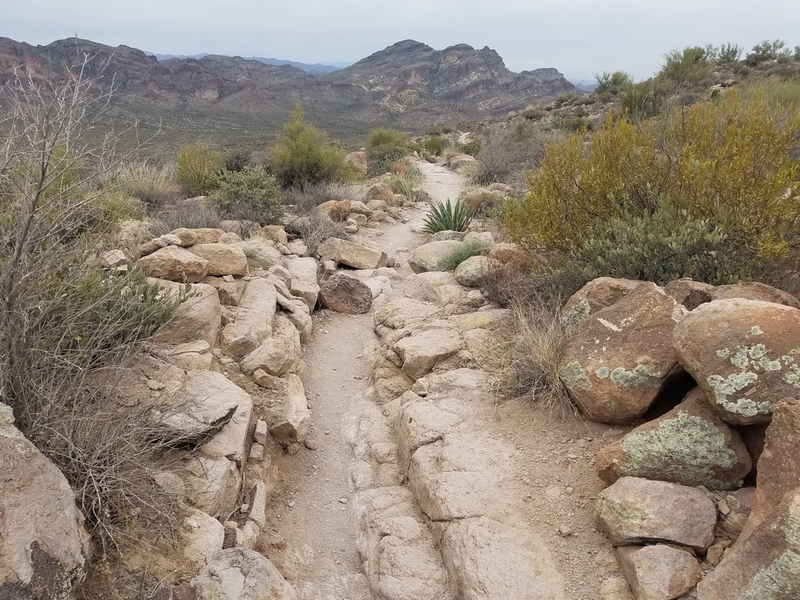 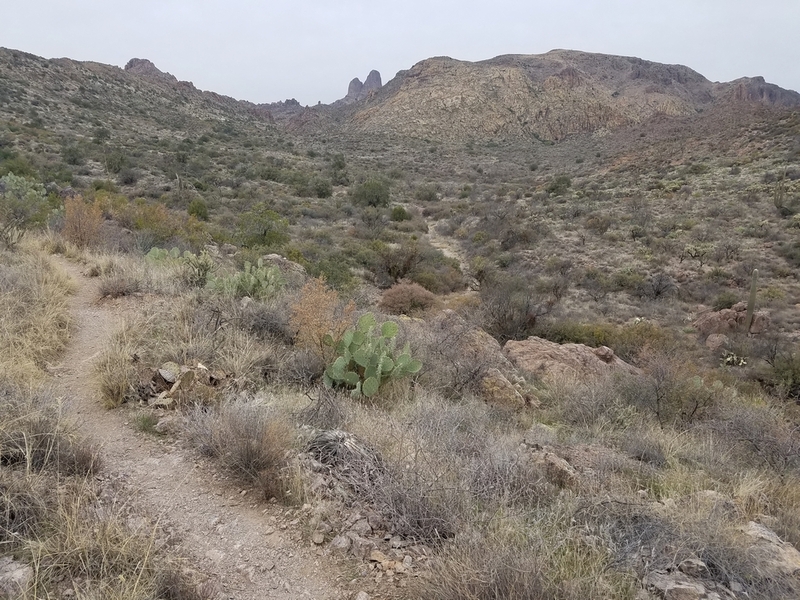 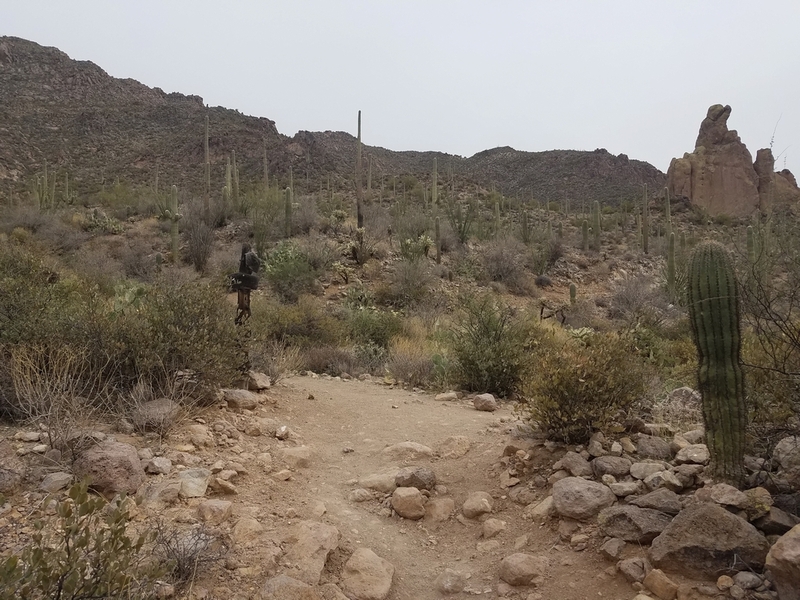 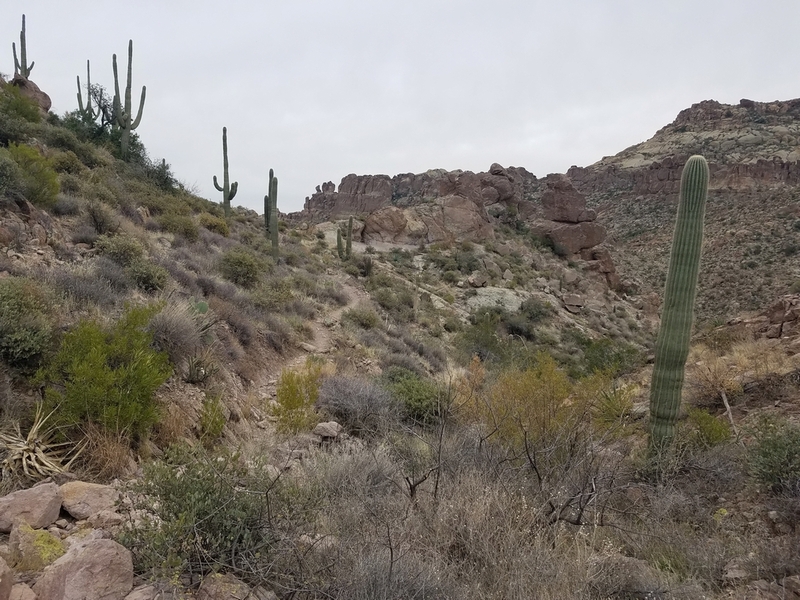 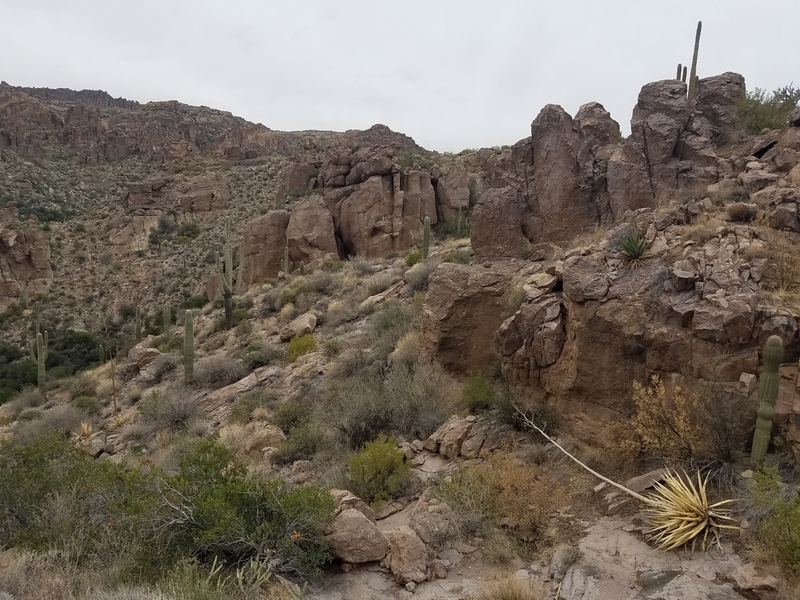 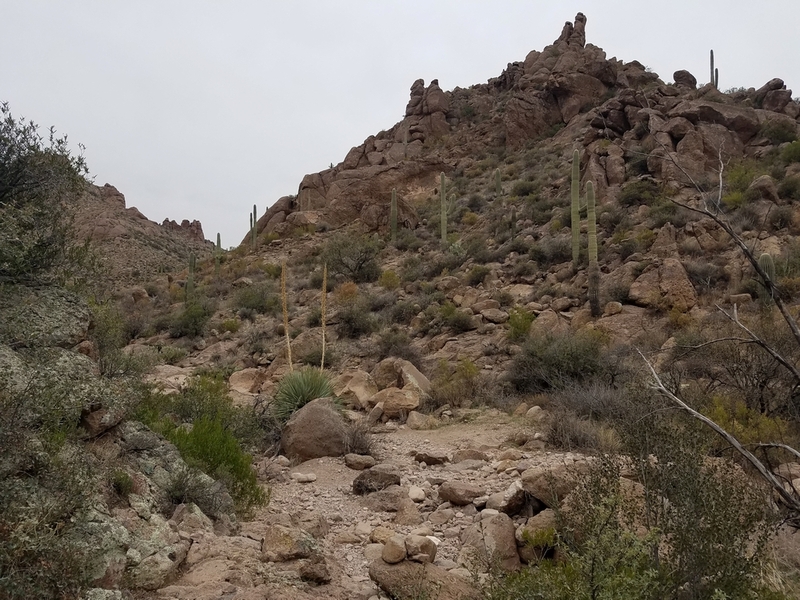 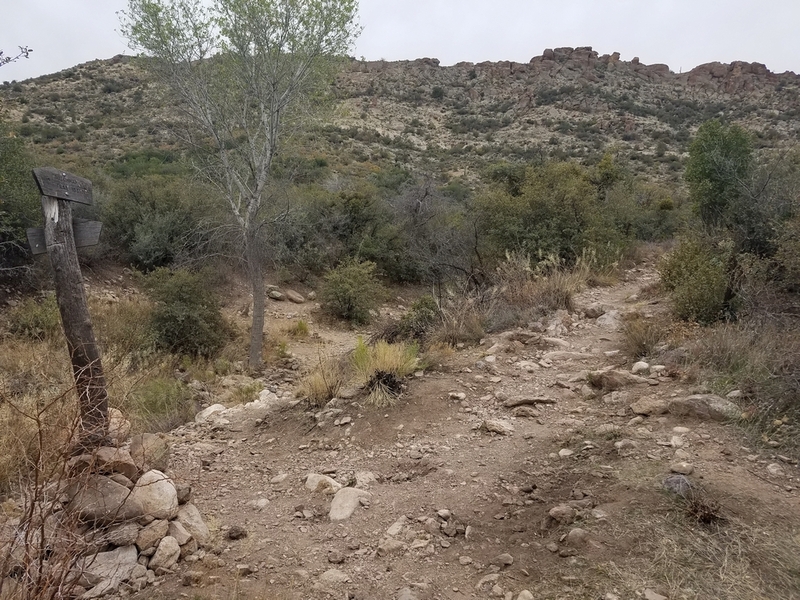 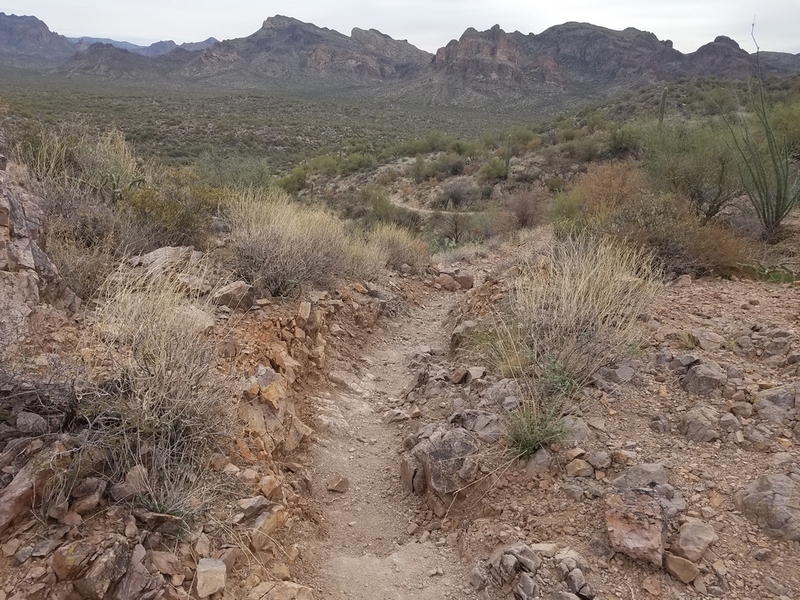 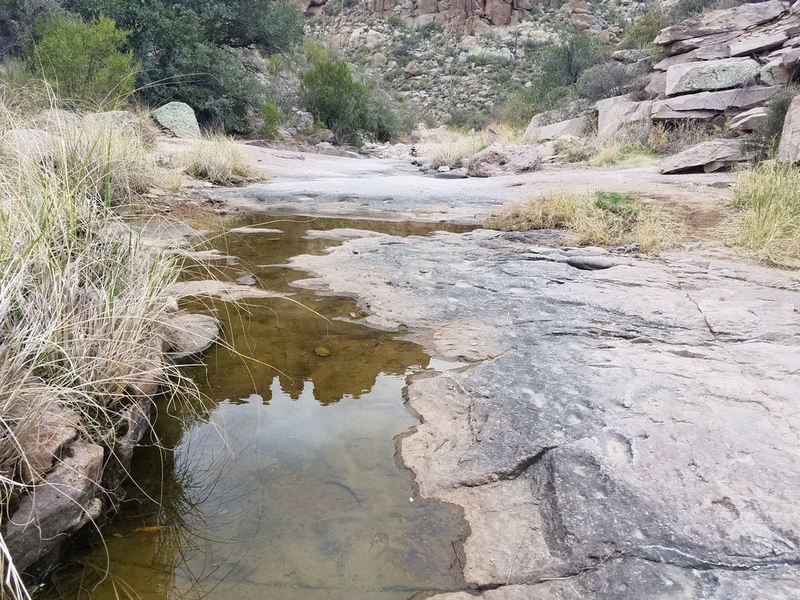 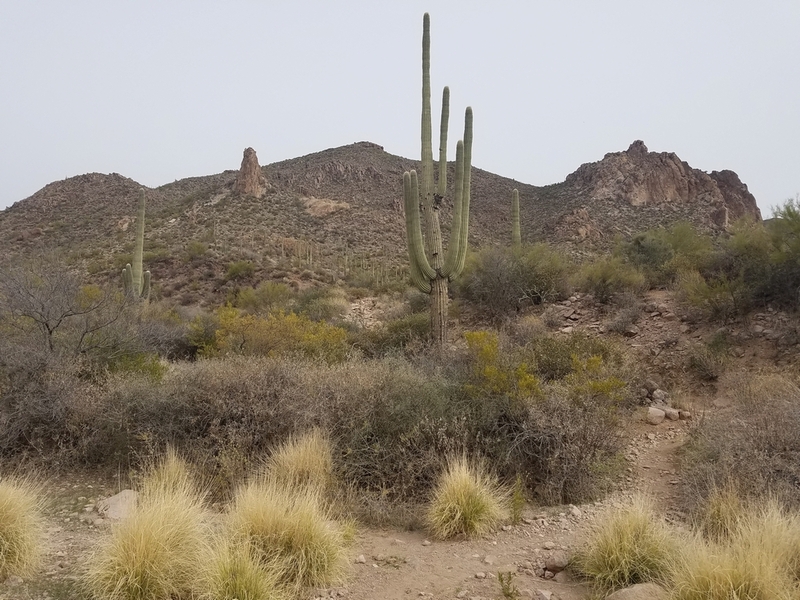 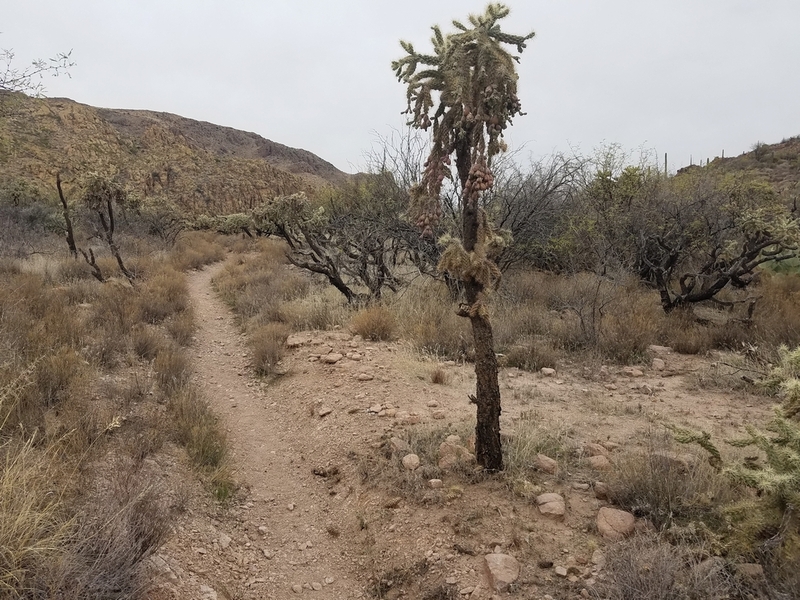 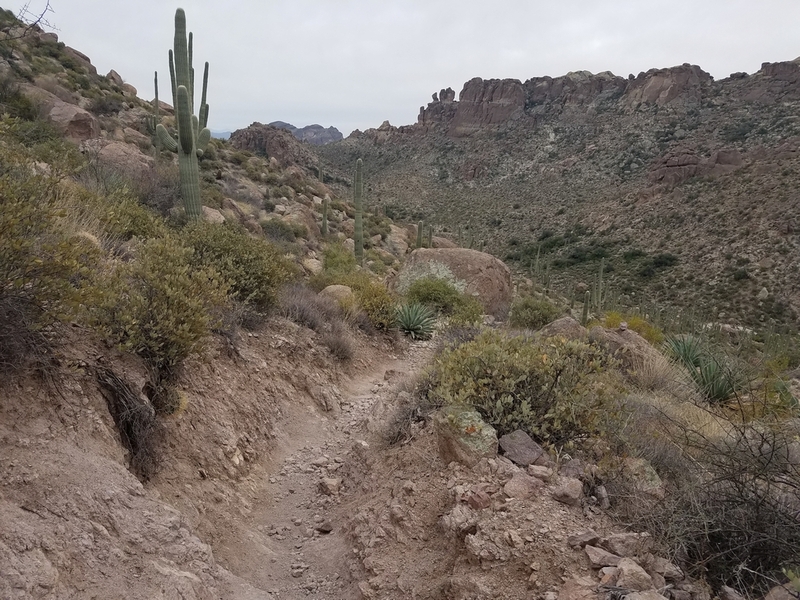 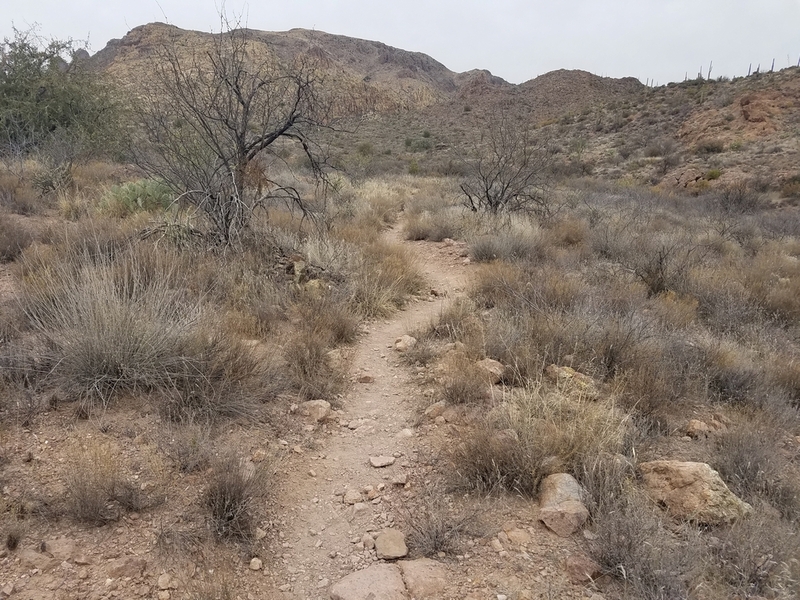 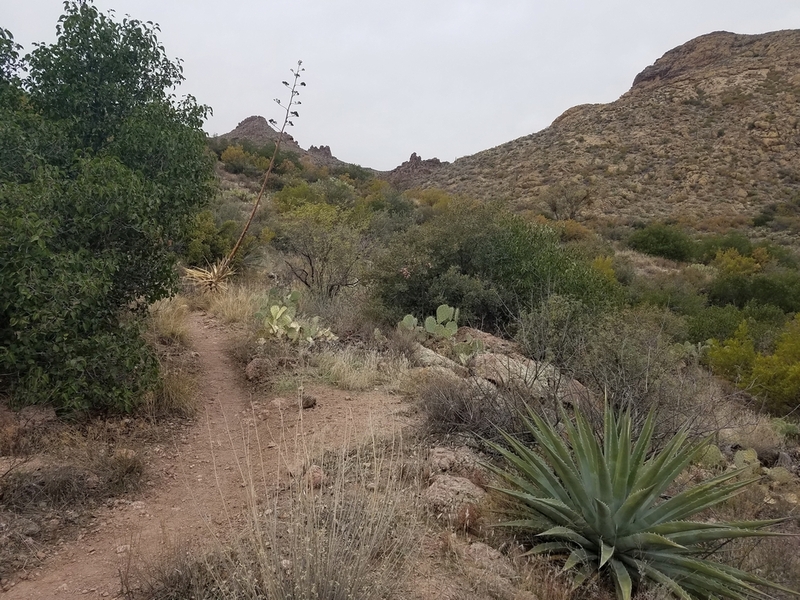 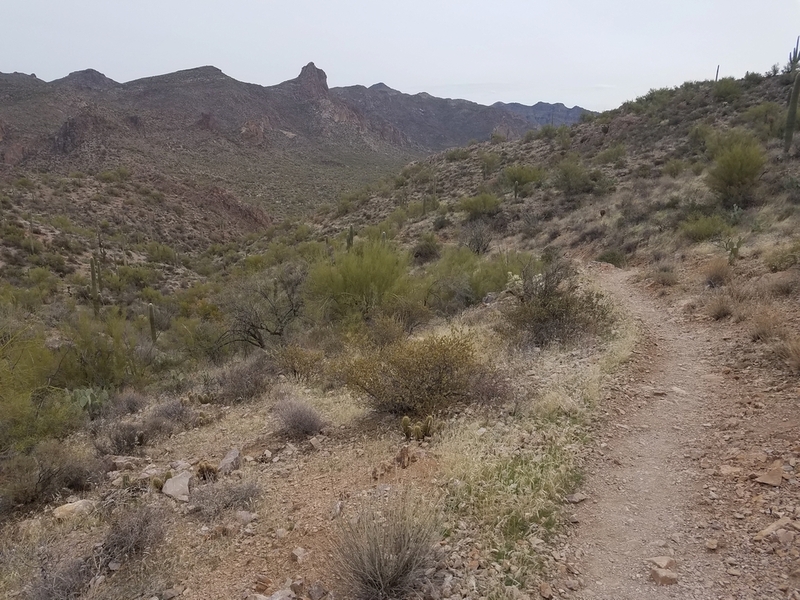 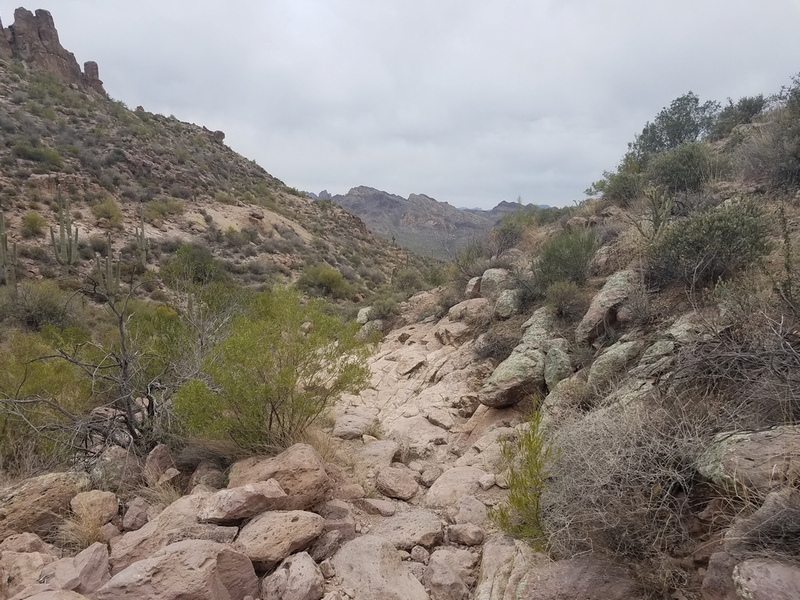 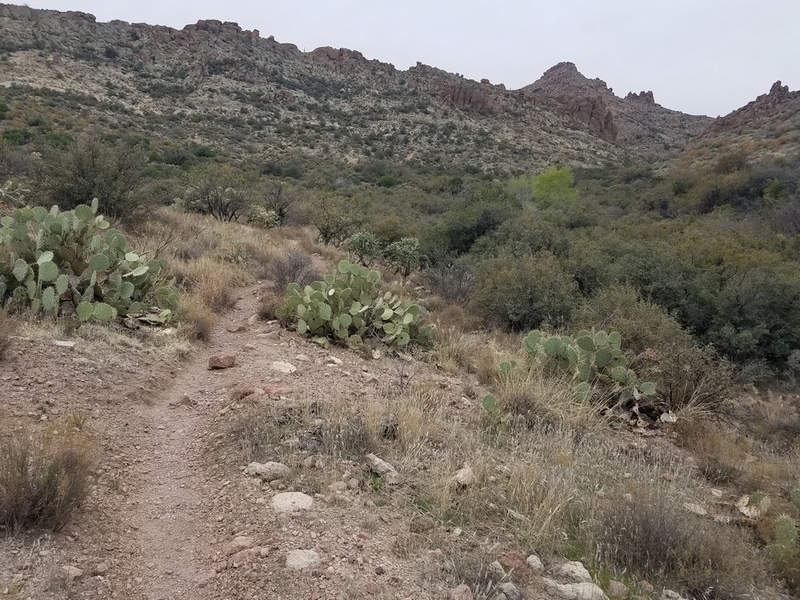 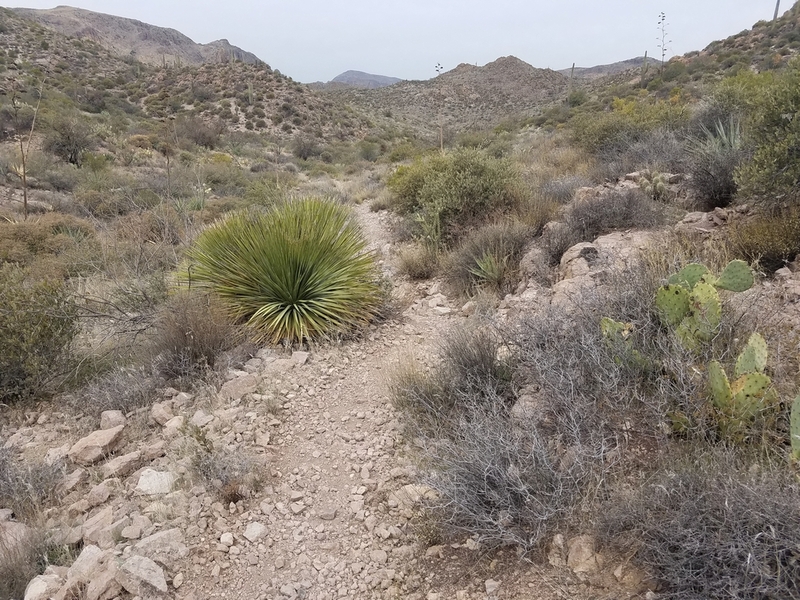 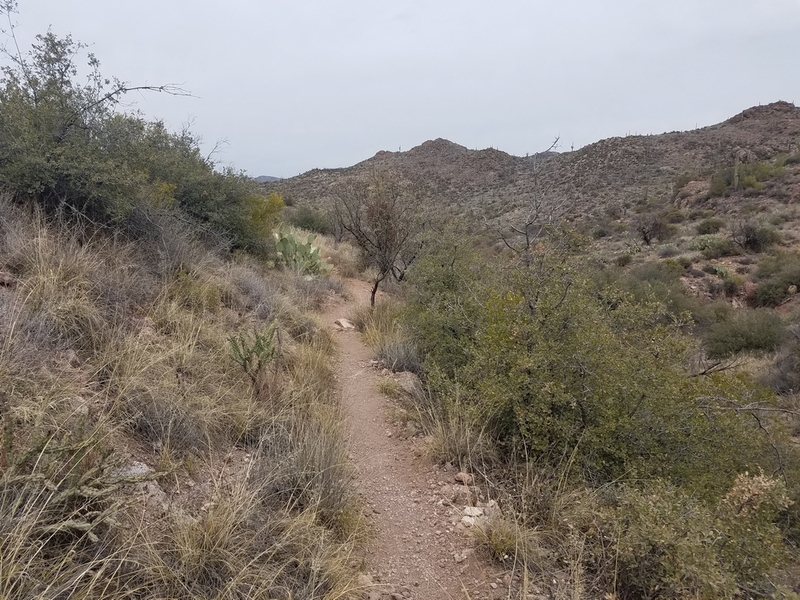 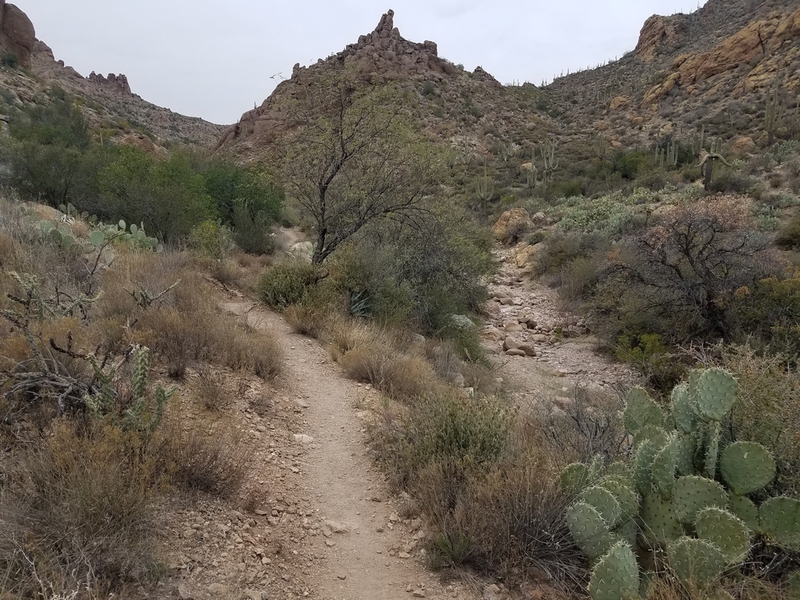 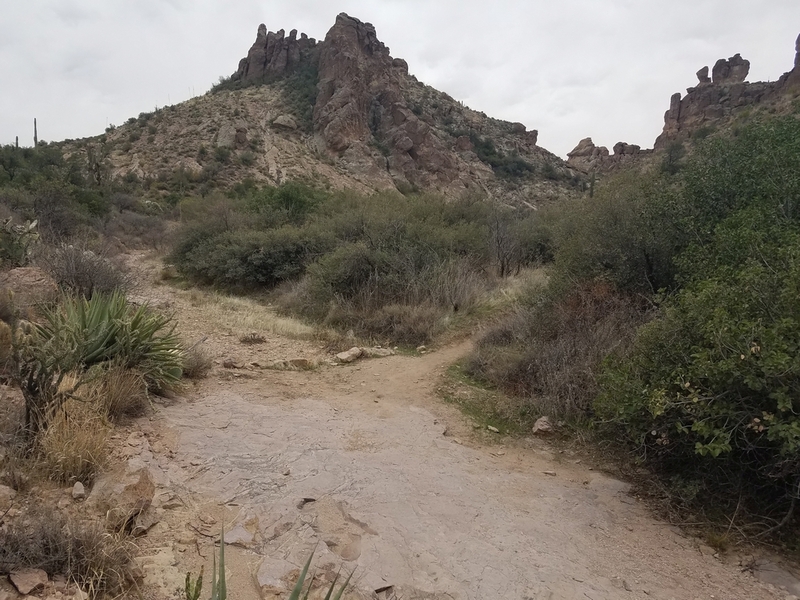 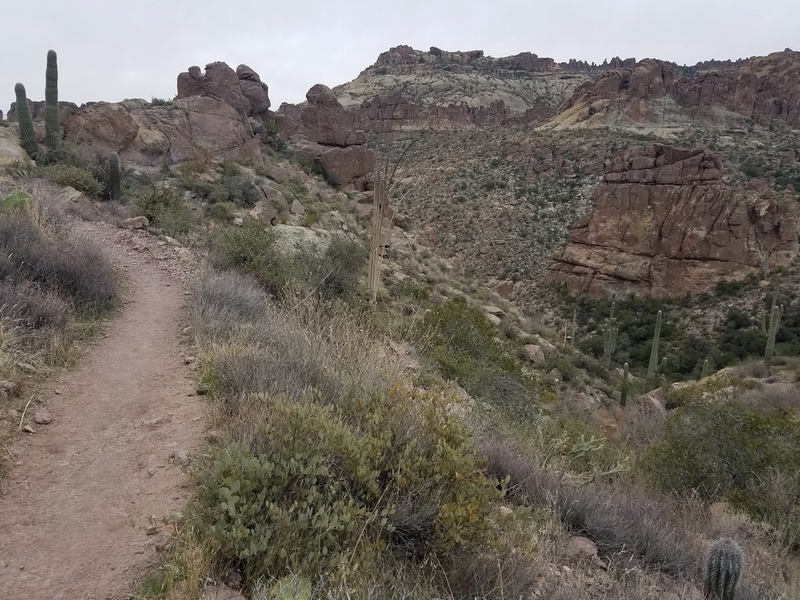 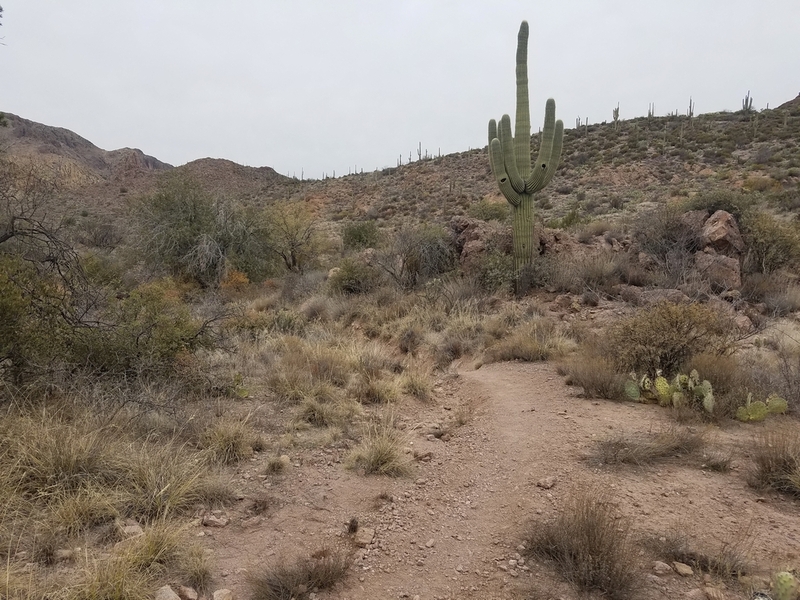 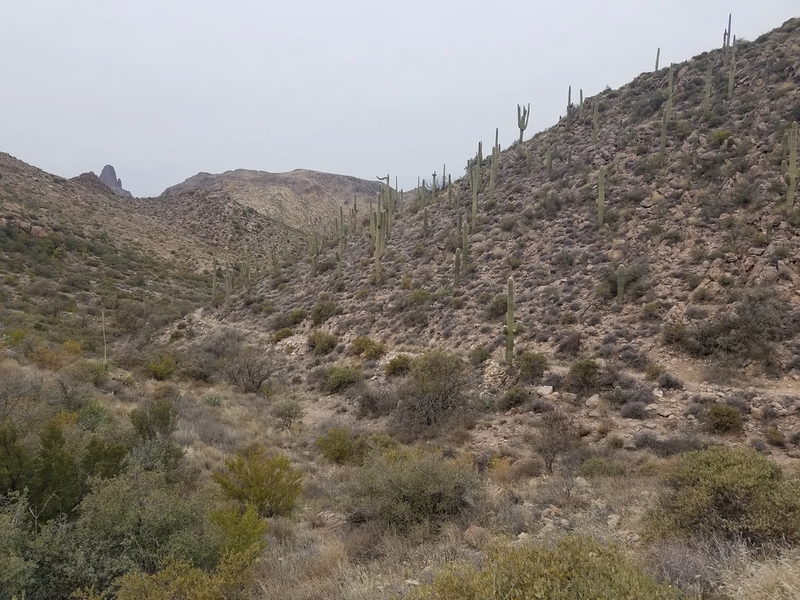 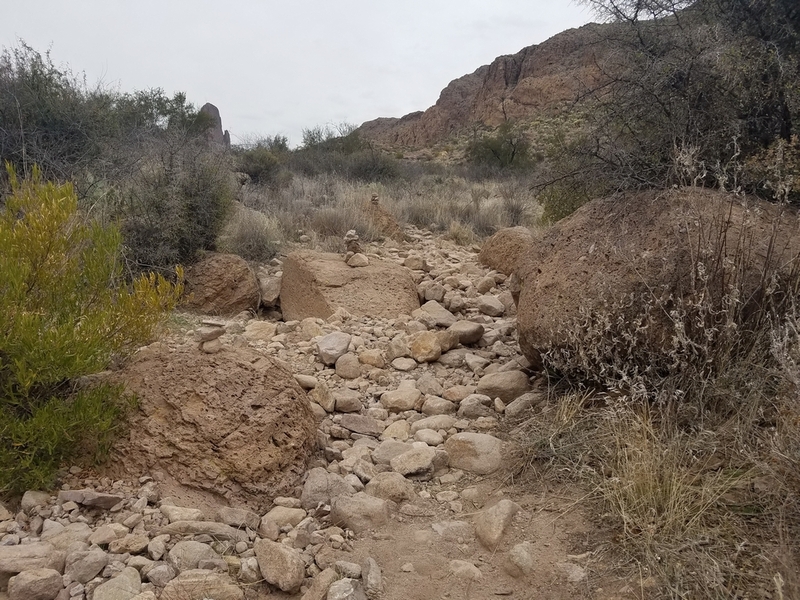 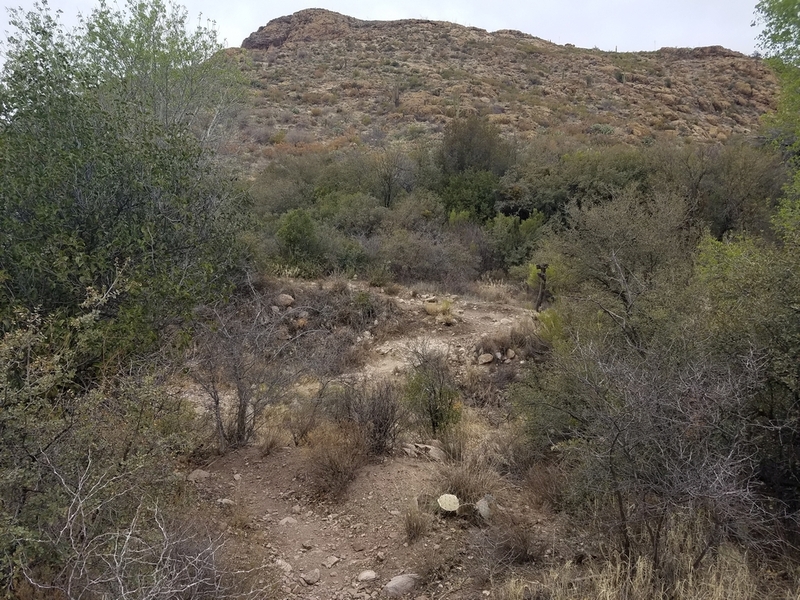 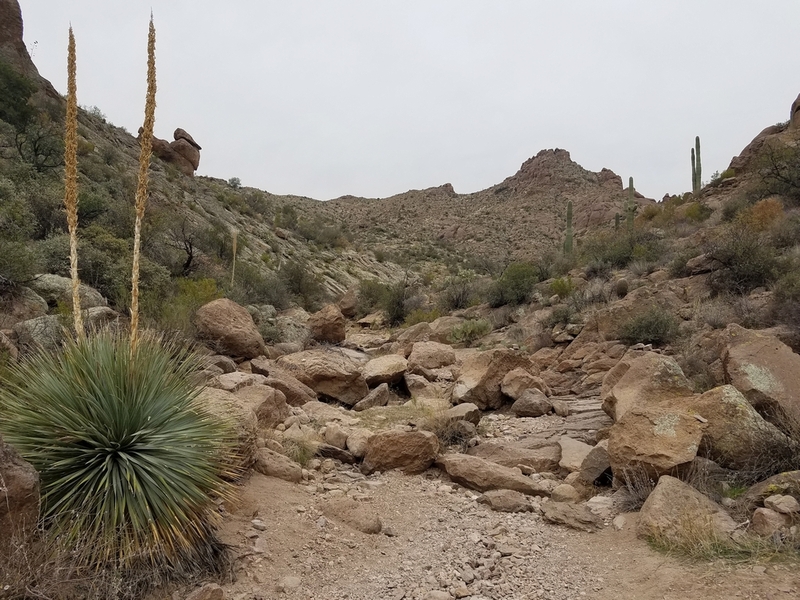 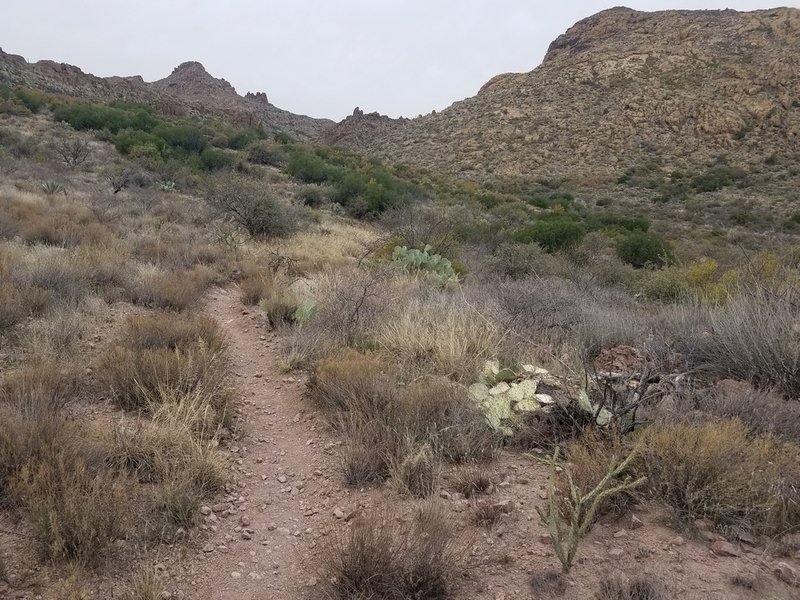 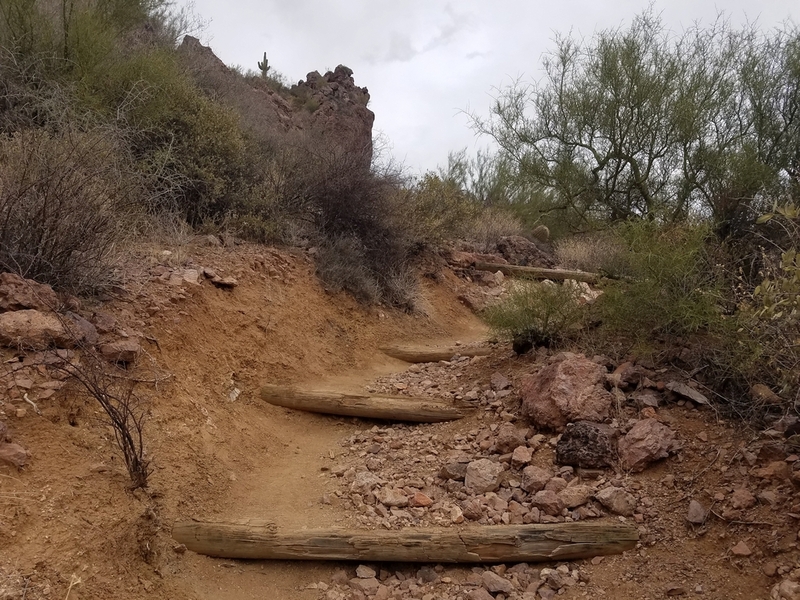 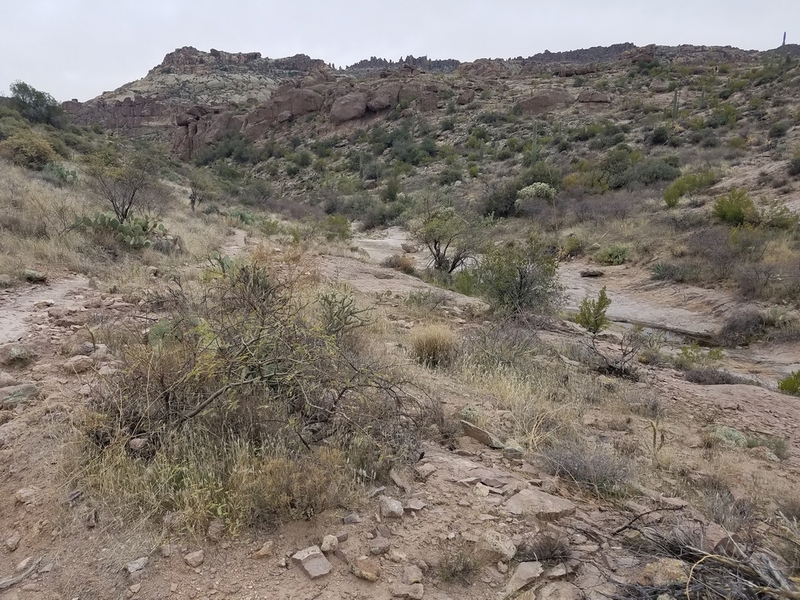 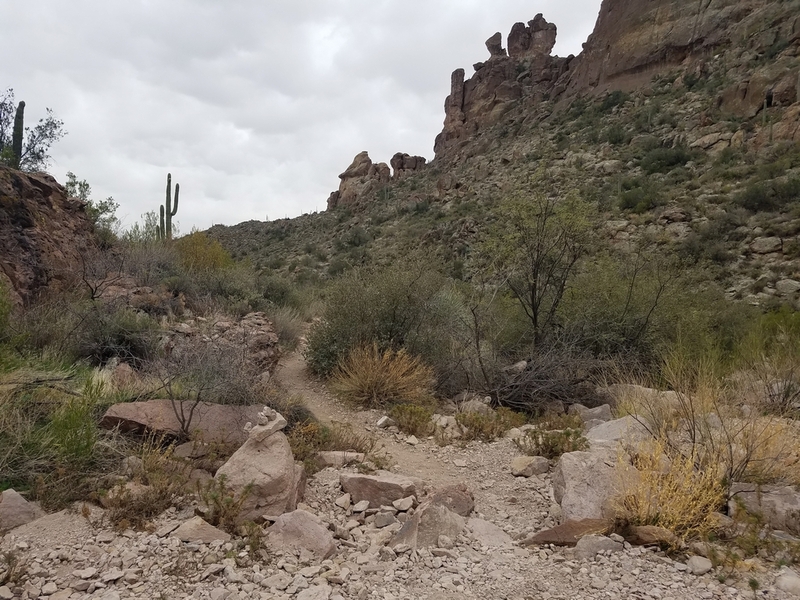 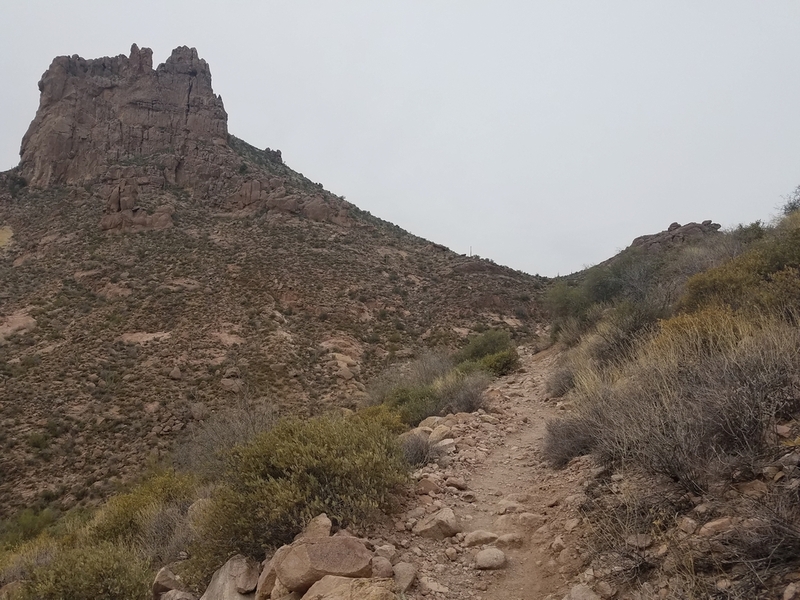 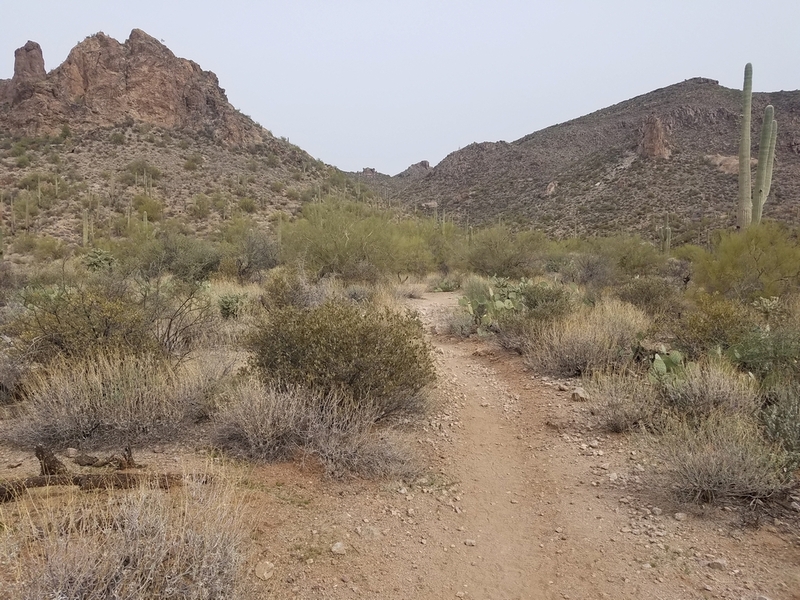 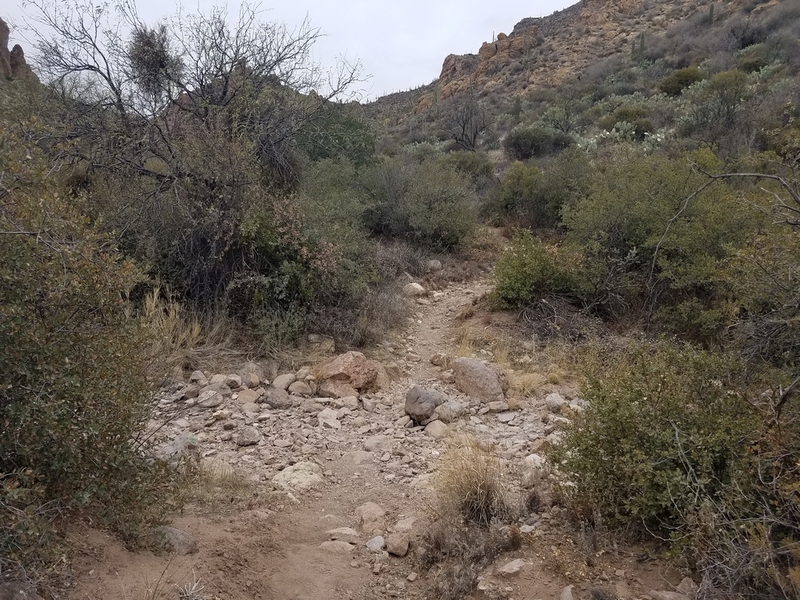 Miners Needle Loop is a moderate, 9-mile hike that follows portions of the Dutchman’s Trail and Bluff Spring Trail as they loop around a rock formation called Miners Needle. 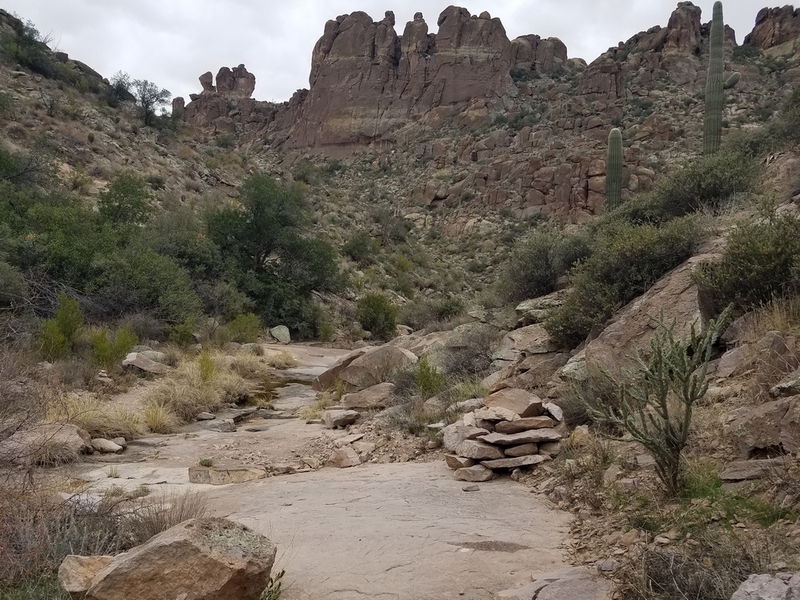 It’s located within the Superstition Wilderness. 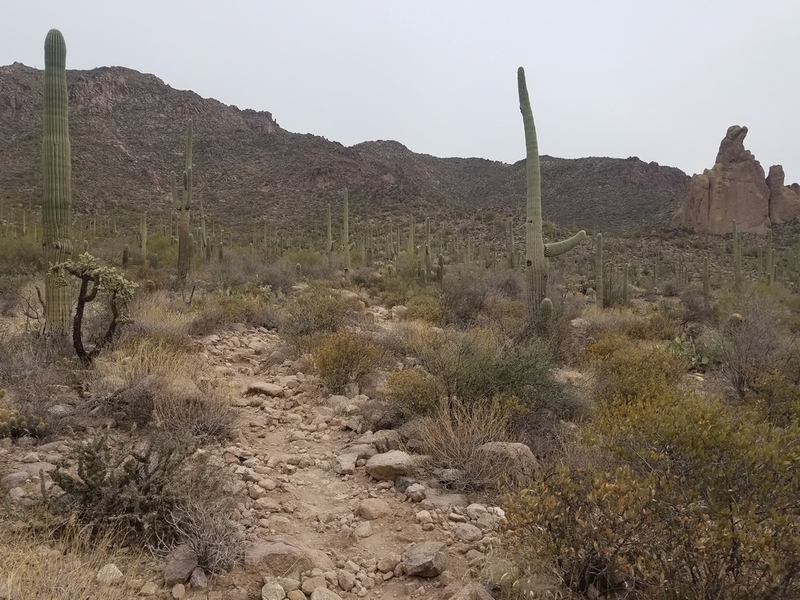 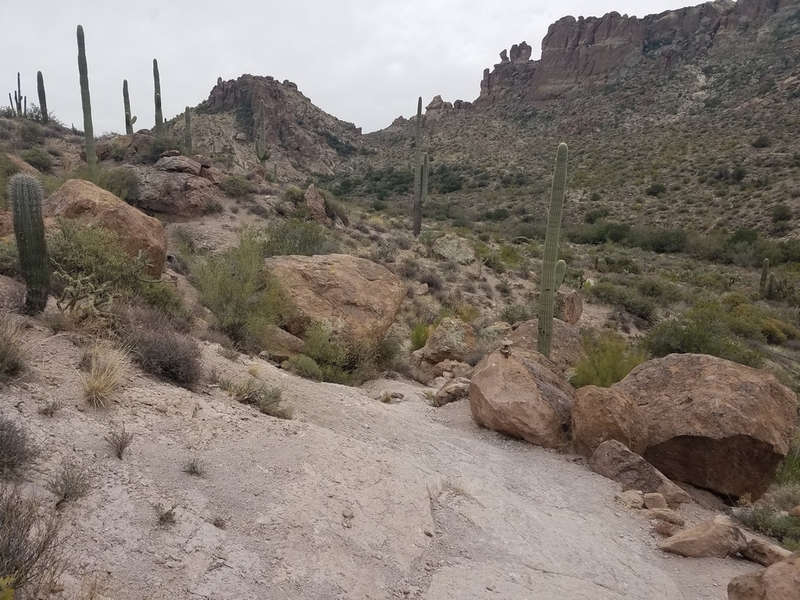 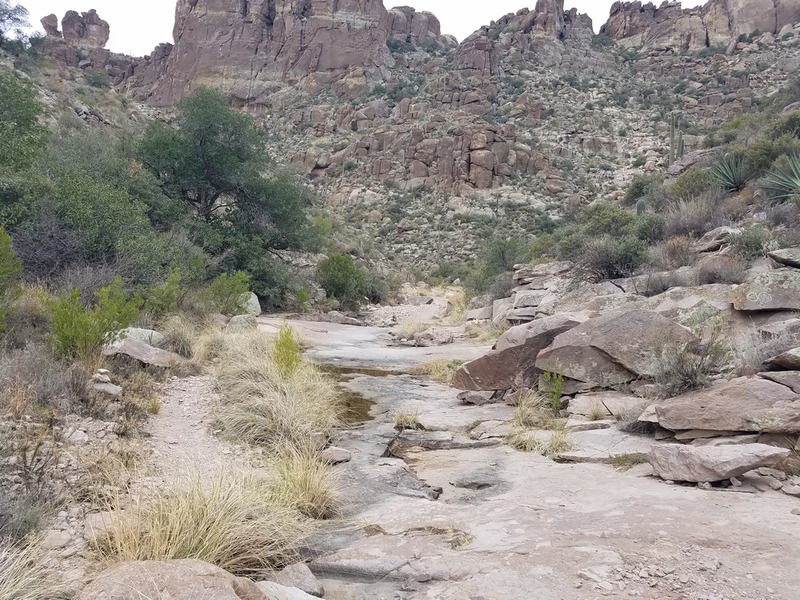 I would highly recommend bringing a hiking partner to complete this loop, since it is a very remote area and in places like this anything can happen. 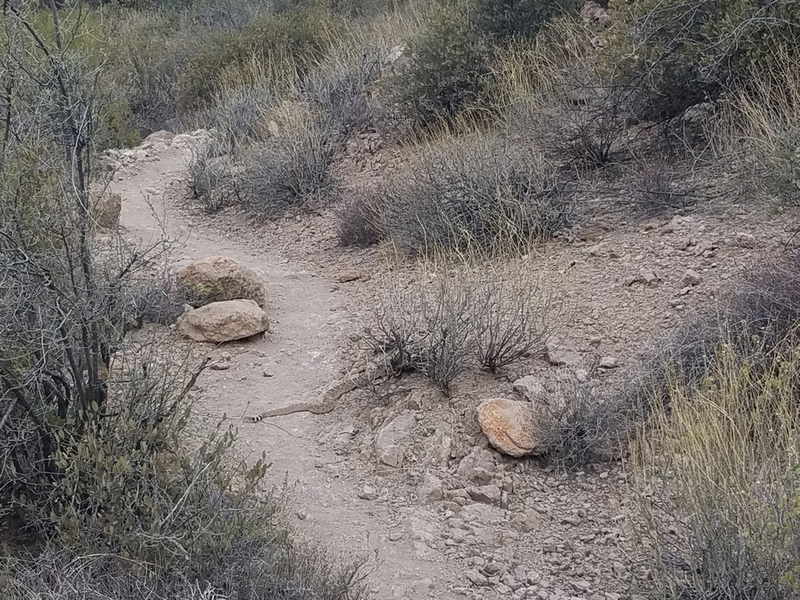 Just in case you come across a rattlesnake, scorpion, a spider, or weather suddenly turns for the worst, you would be safer having another human being with you. 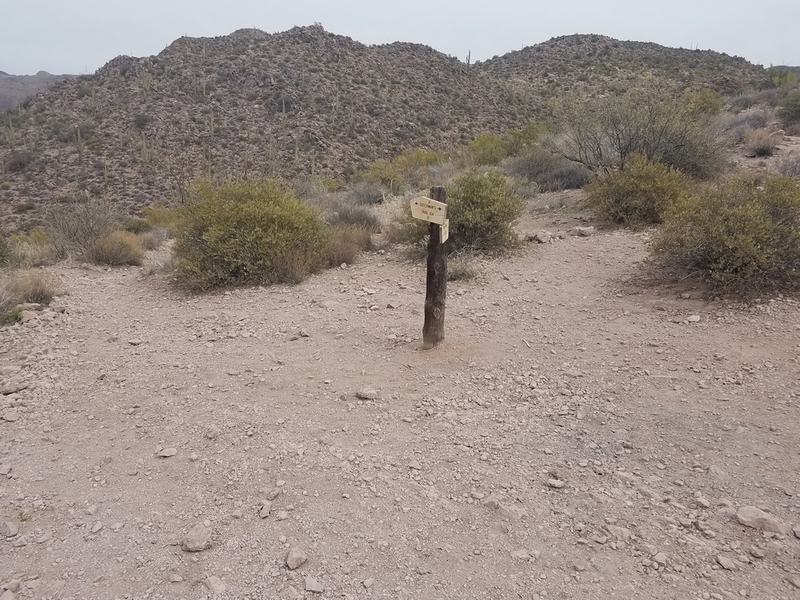 And as with any hike in the desert, bring plenty of water. 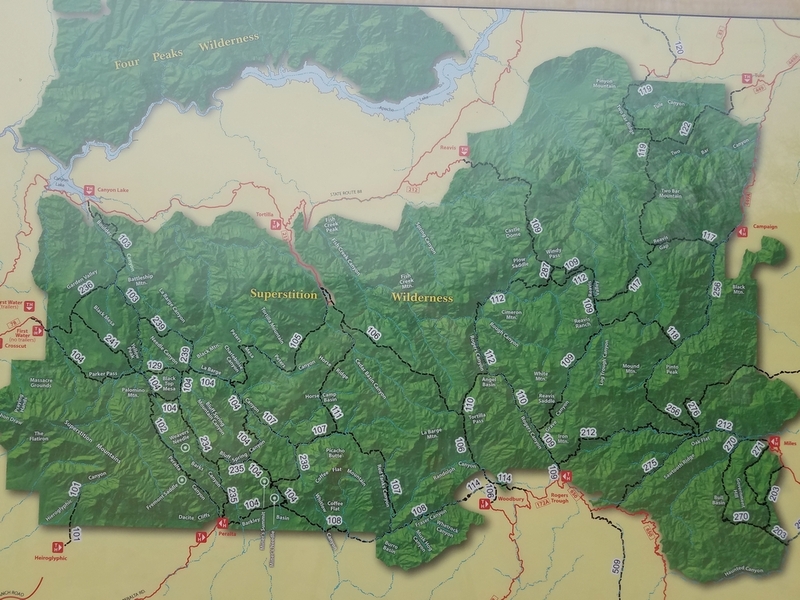 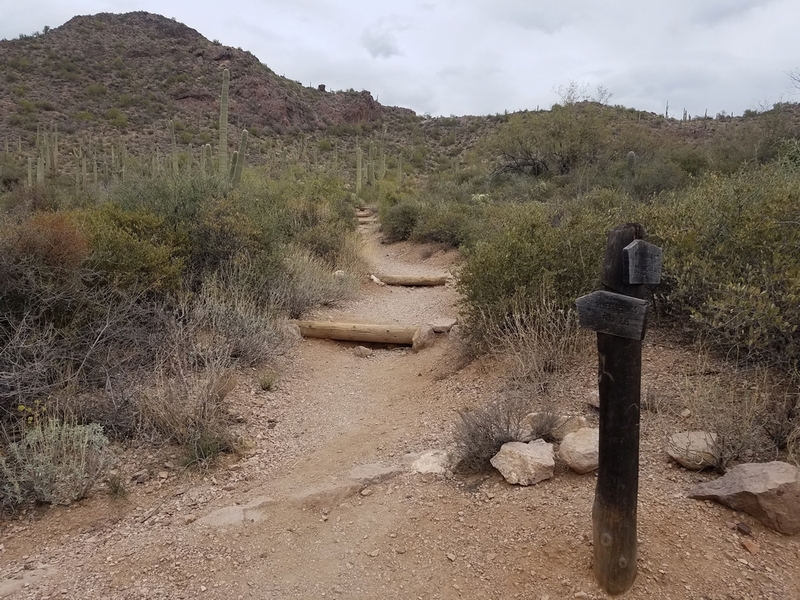 The time to complete this hike will vary, depending on your pace and your breaks, but plan to be on the trail anywhere between 4-5 hours. 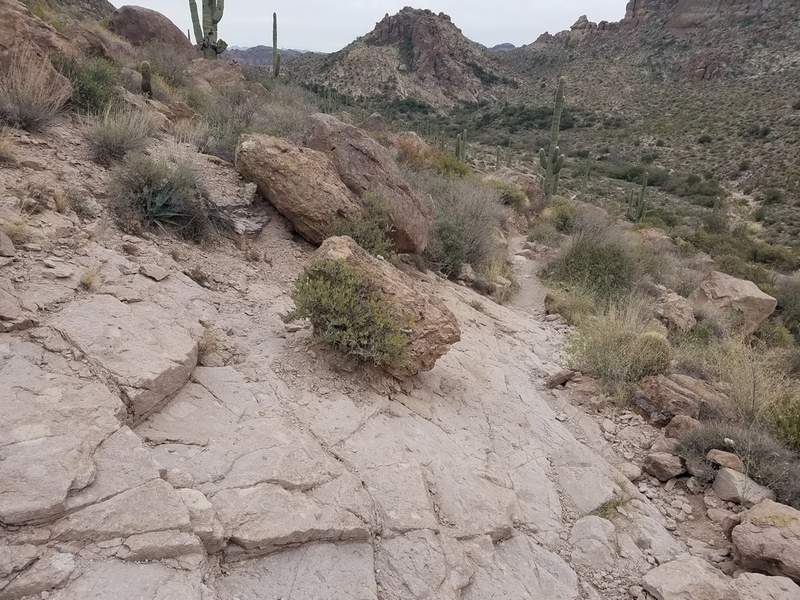 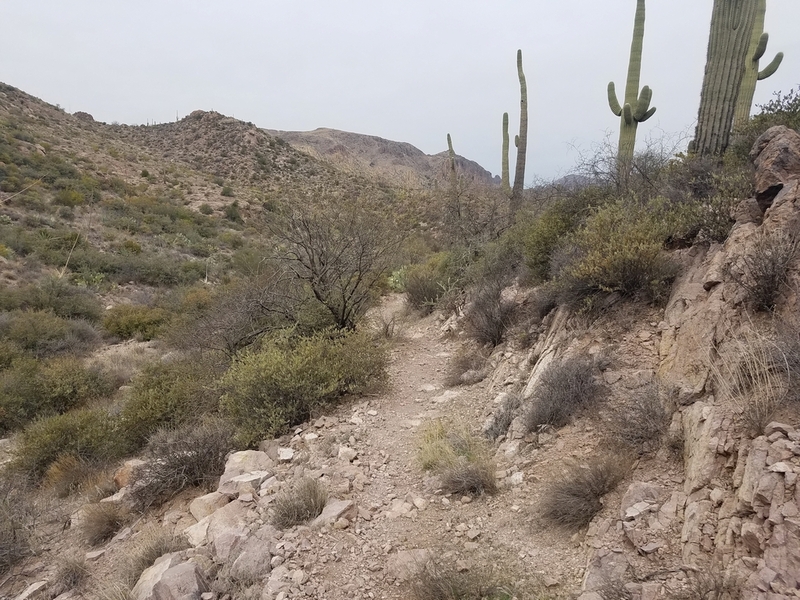 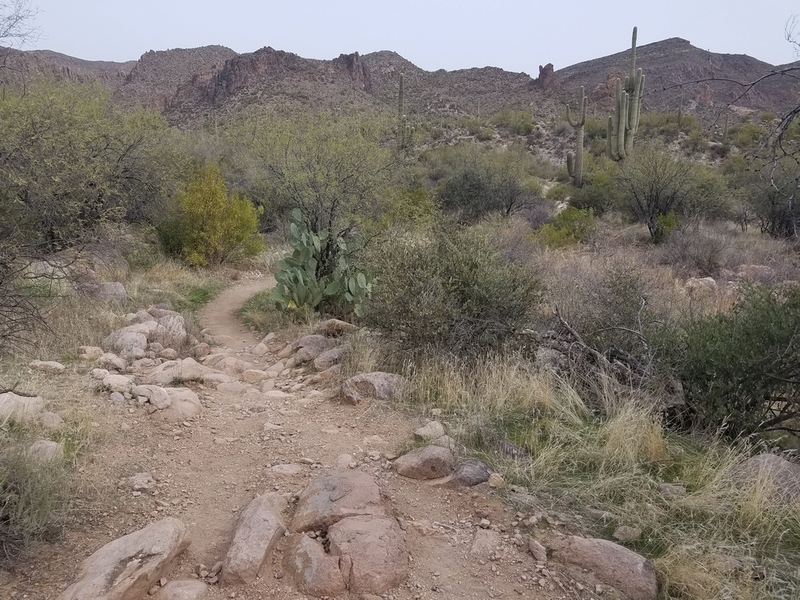 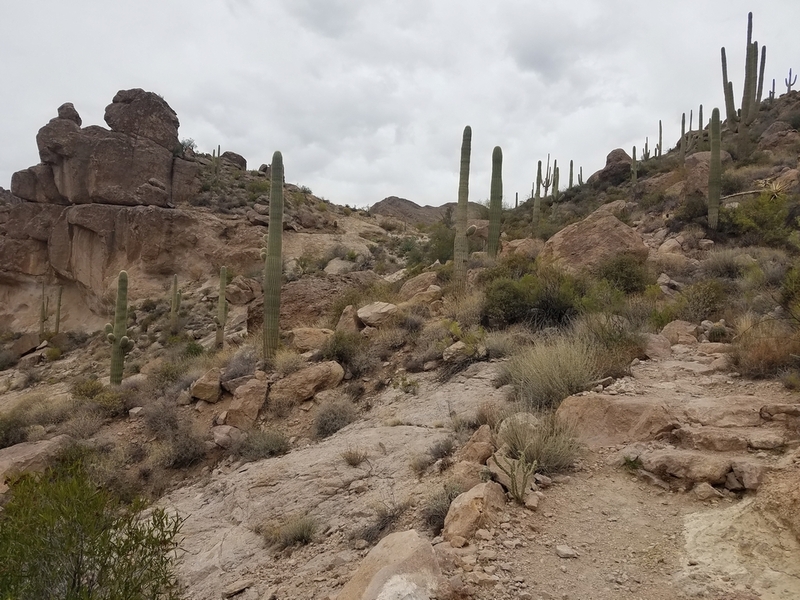 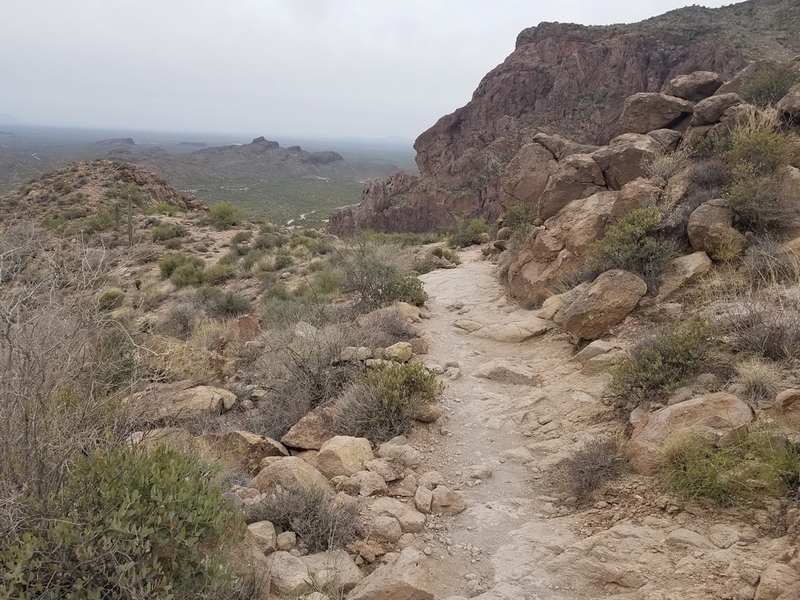 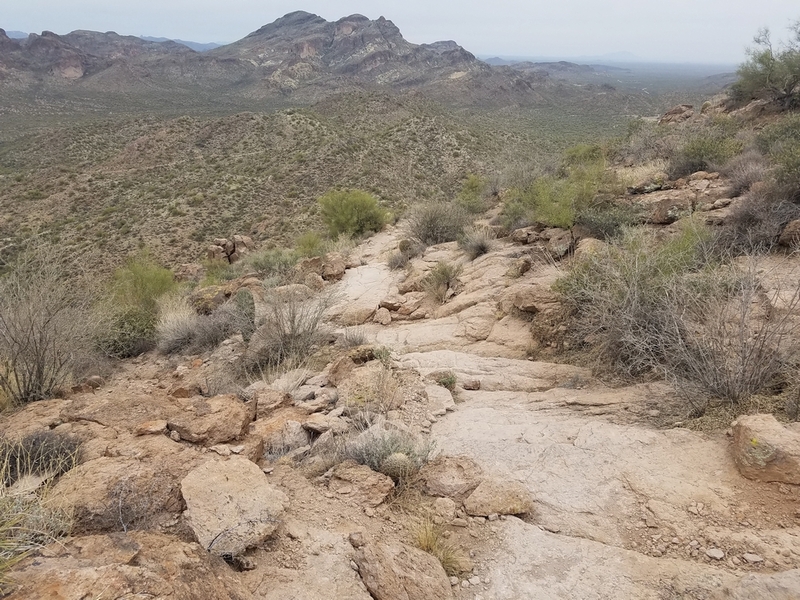 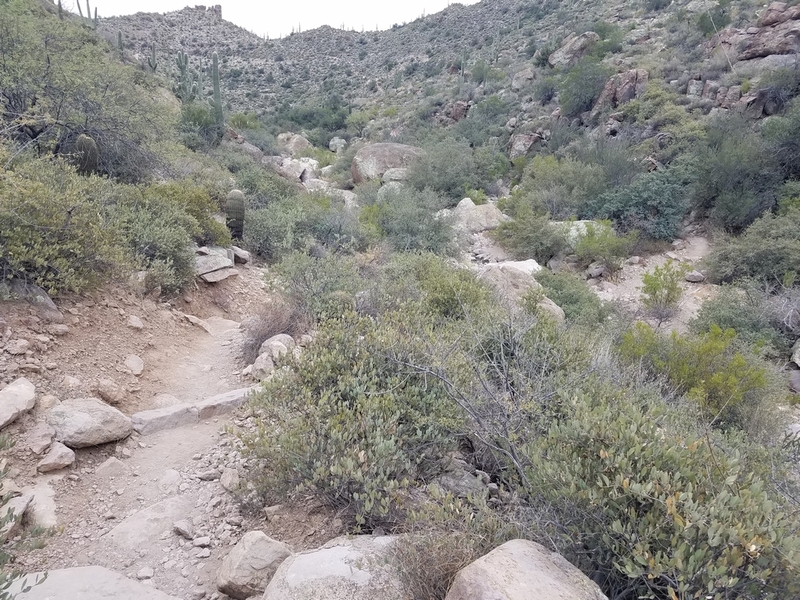 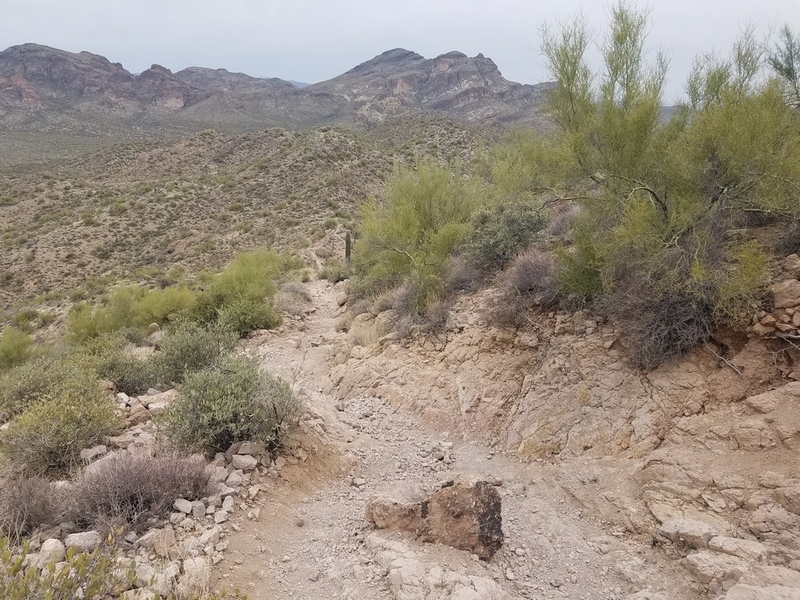 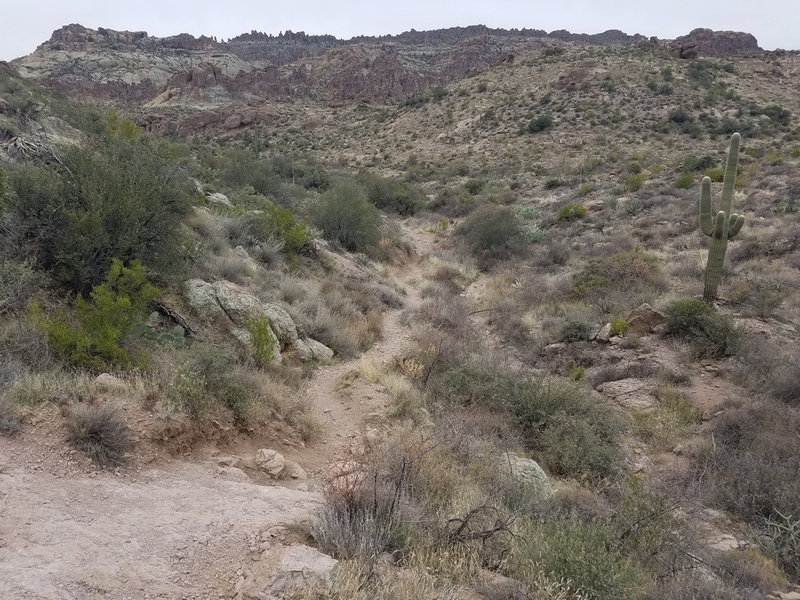 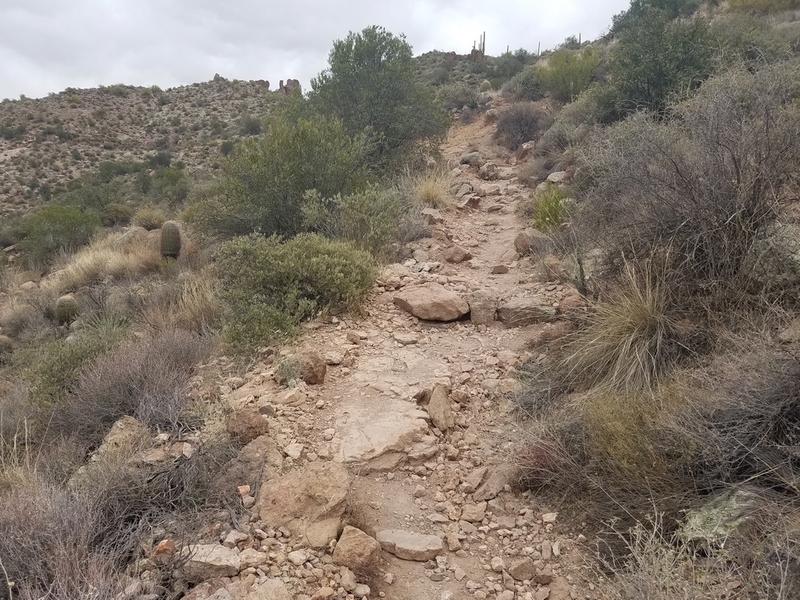 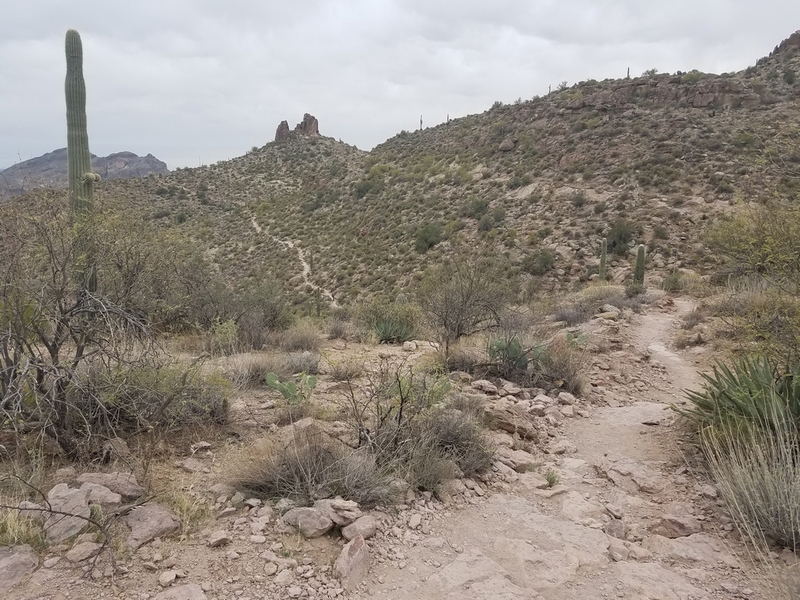 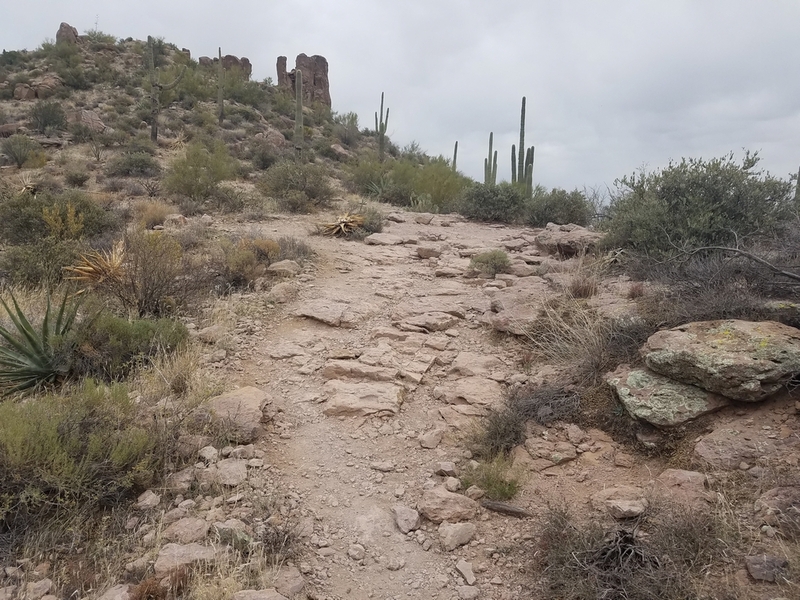 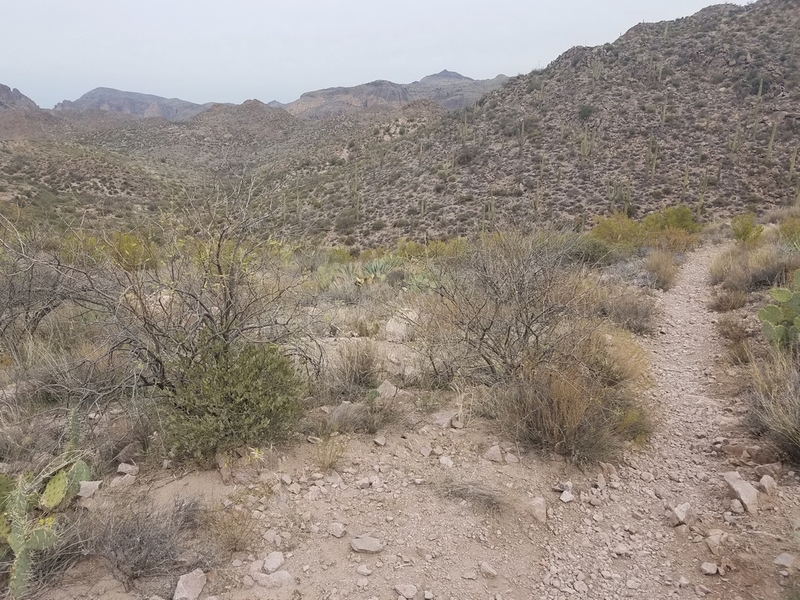 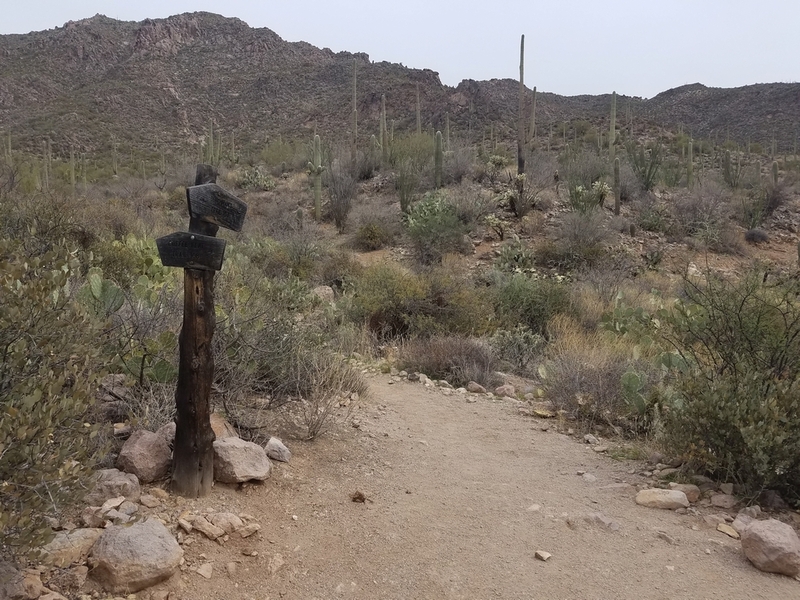 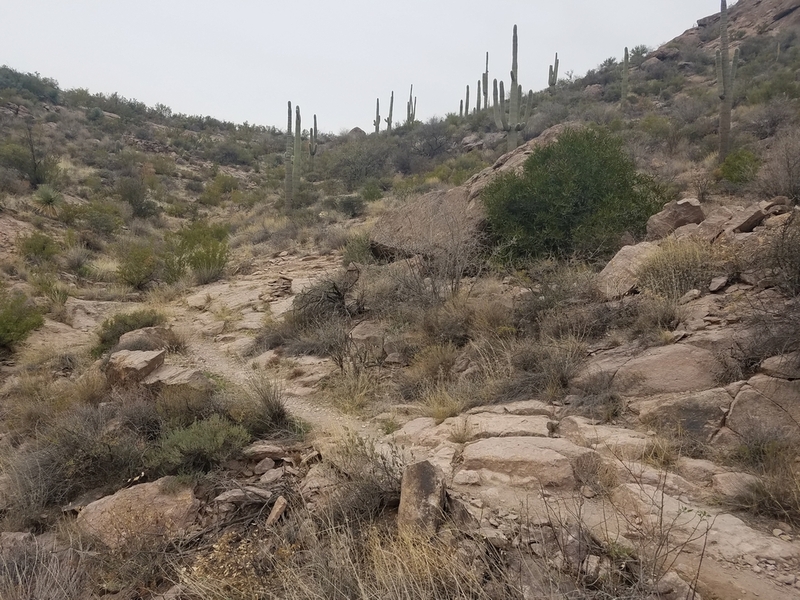 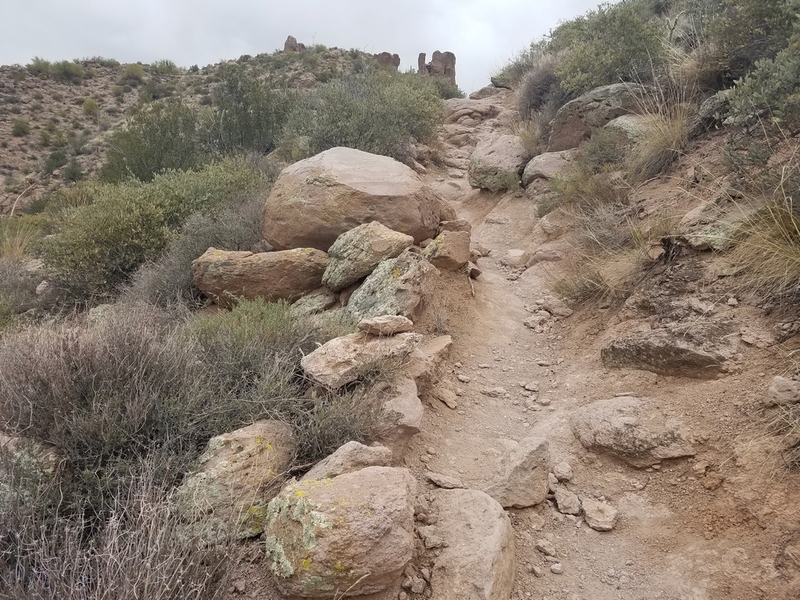 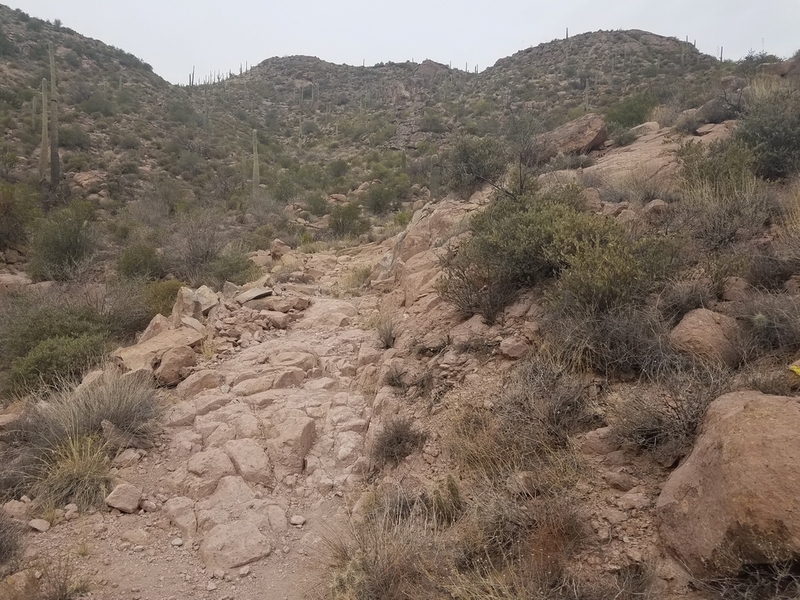 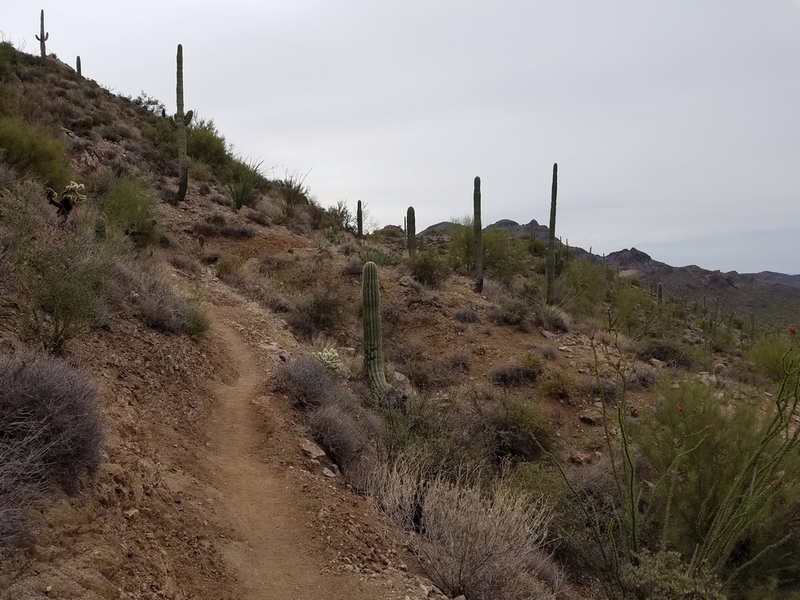 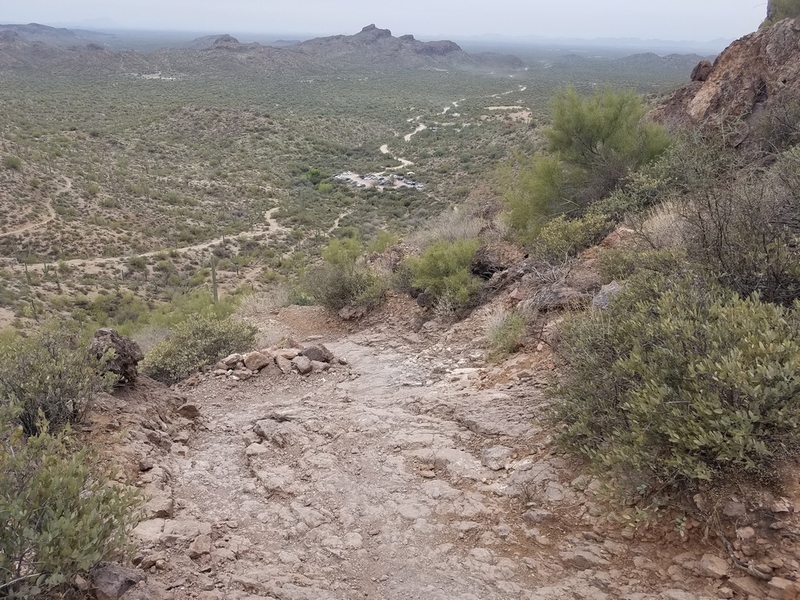 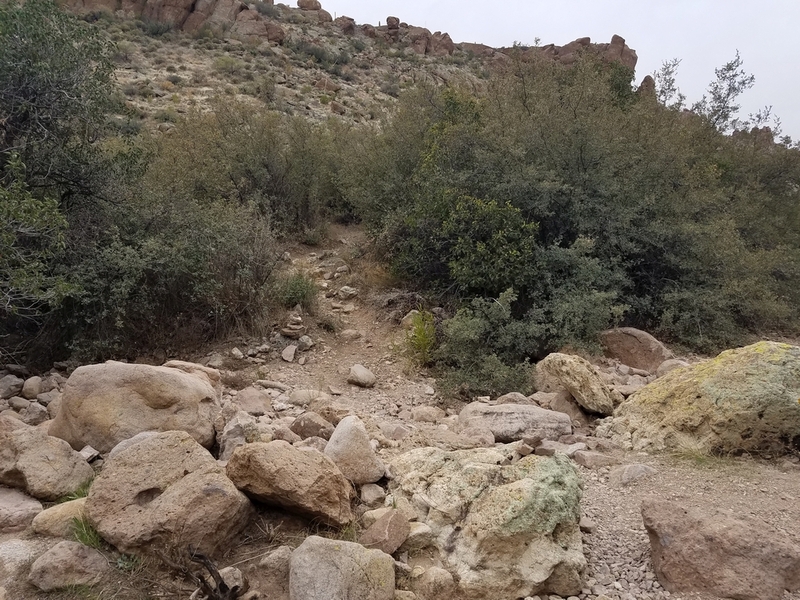 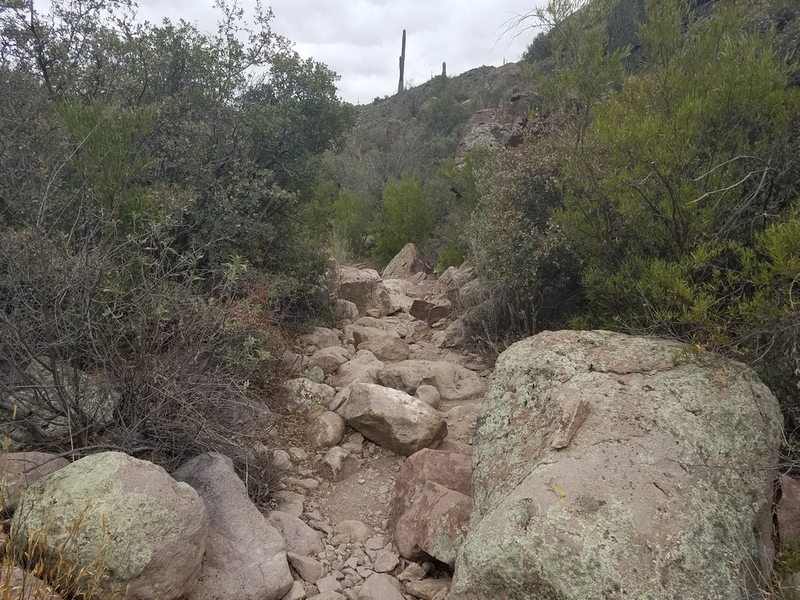 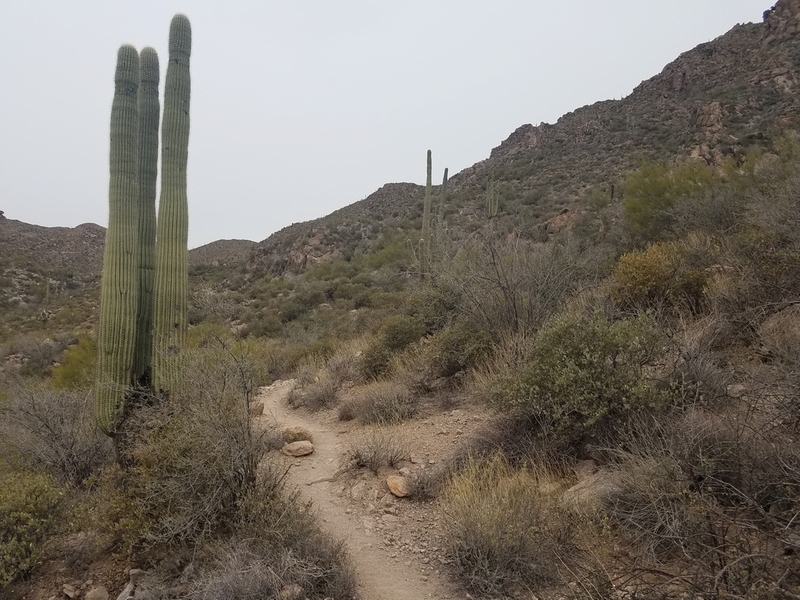 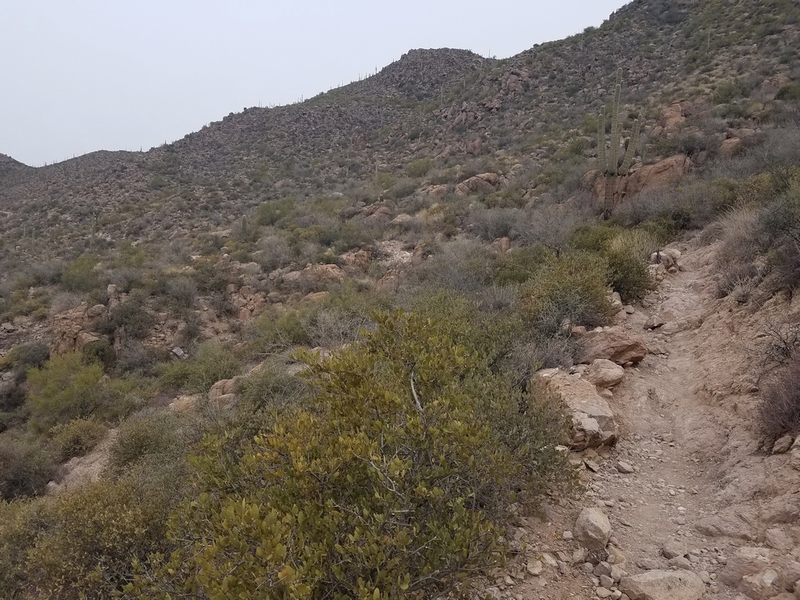 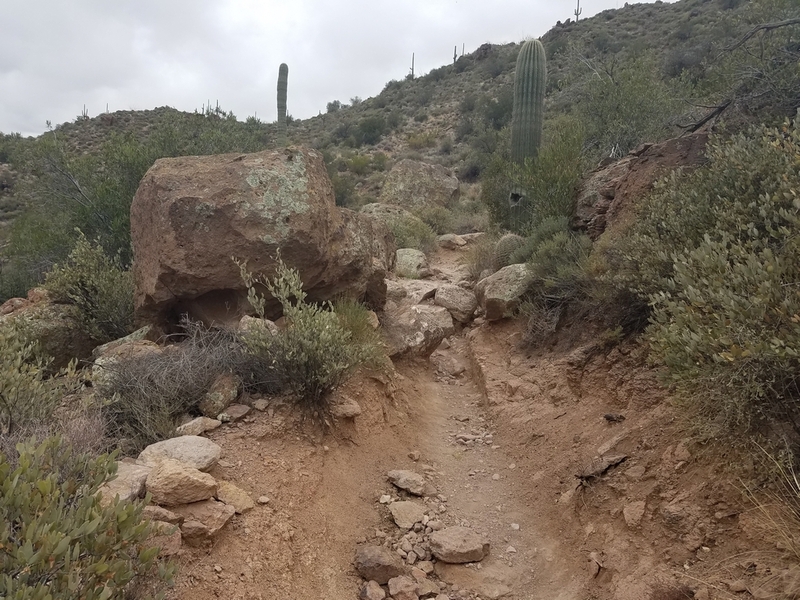 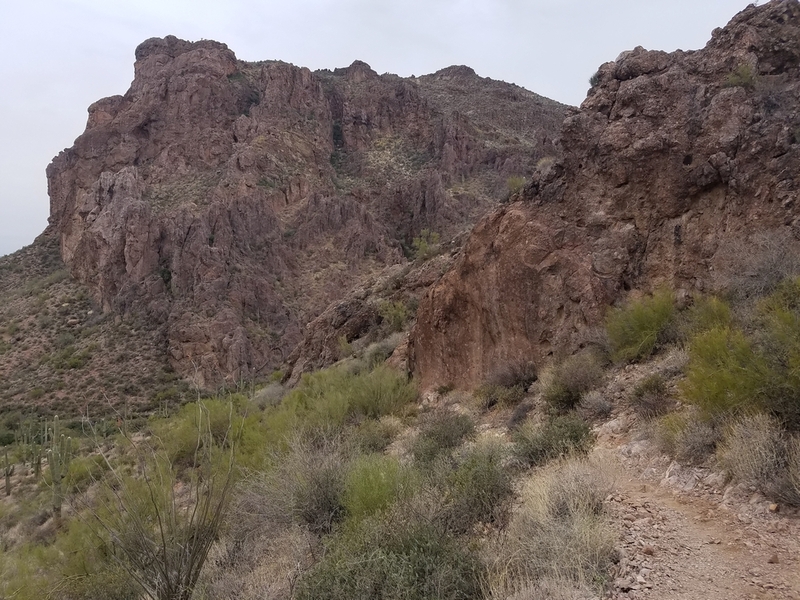 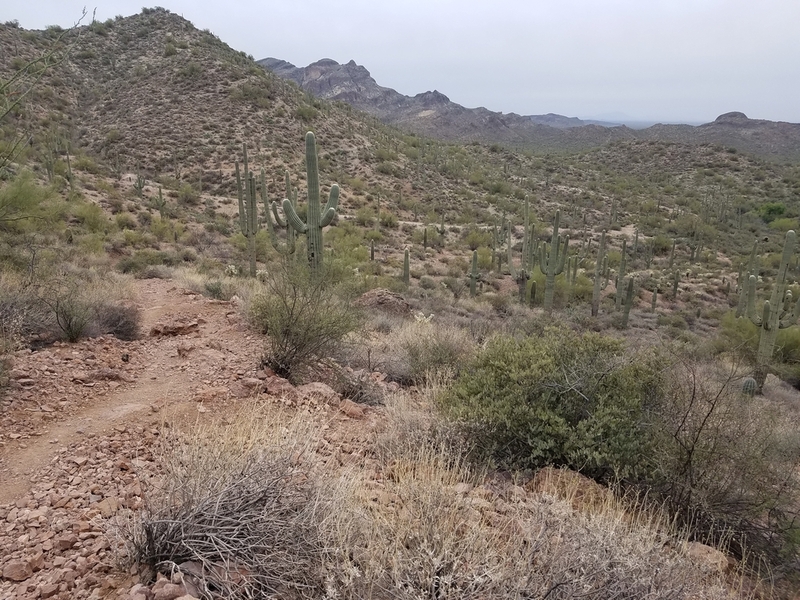 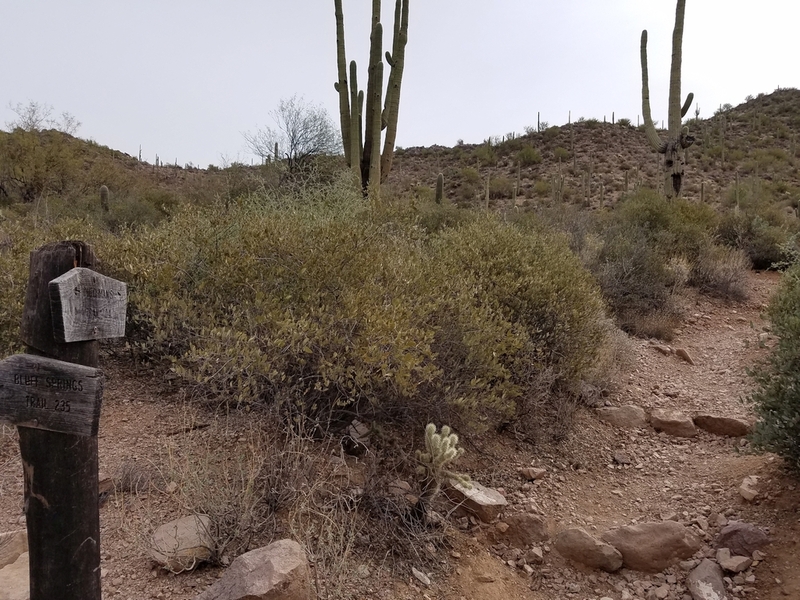 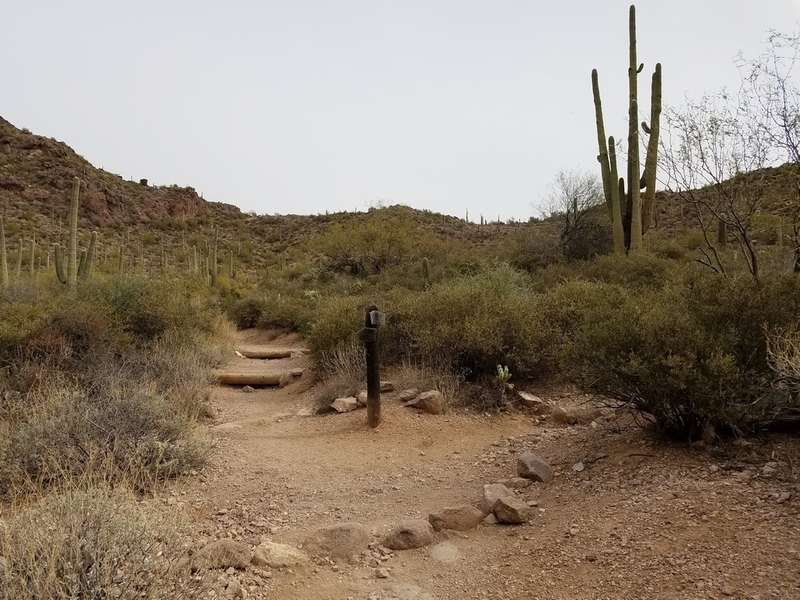 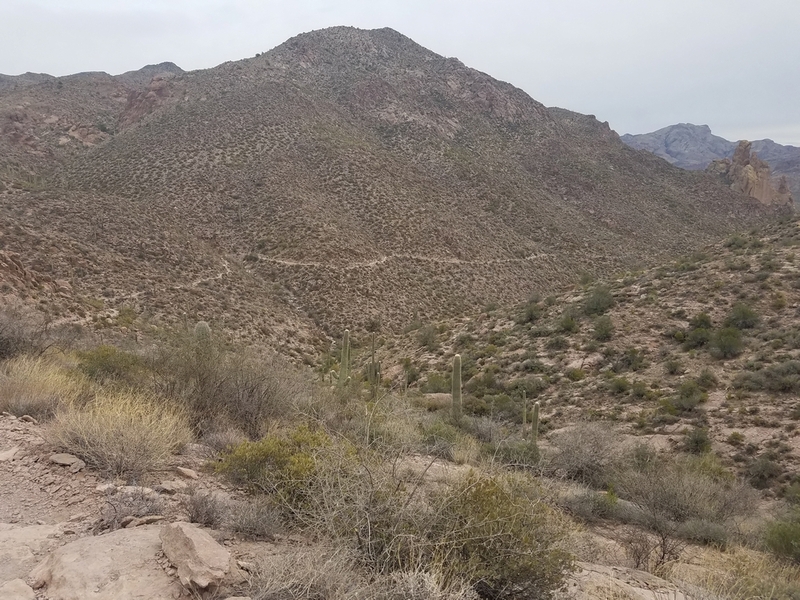 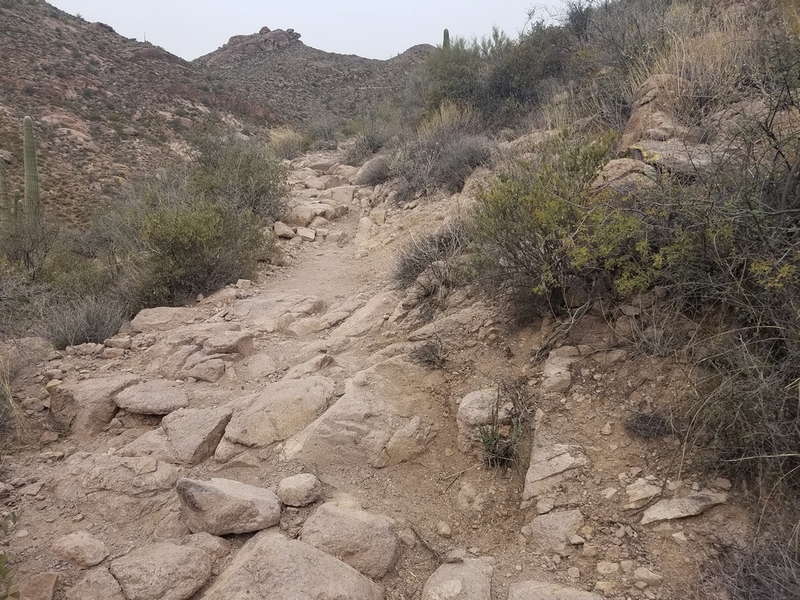 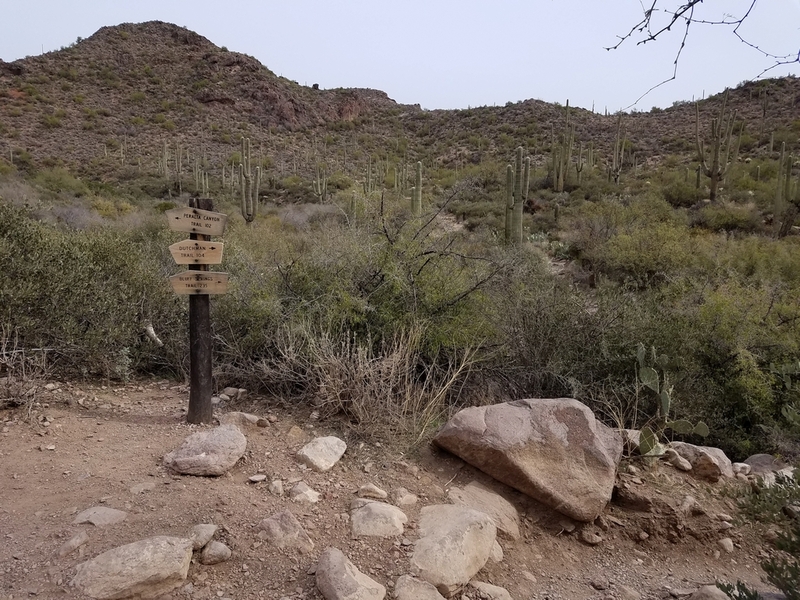 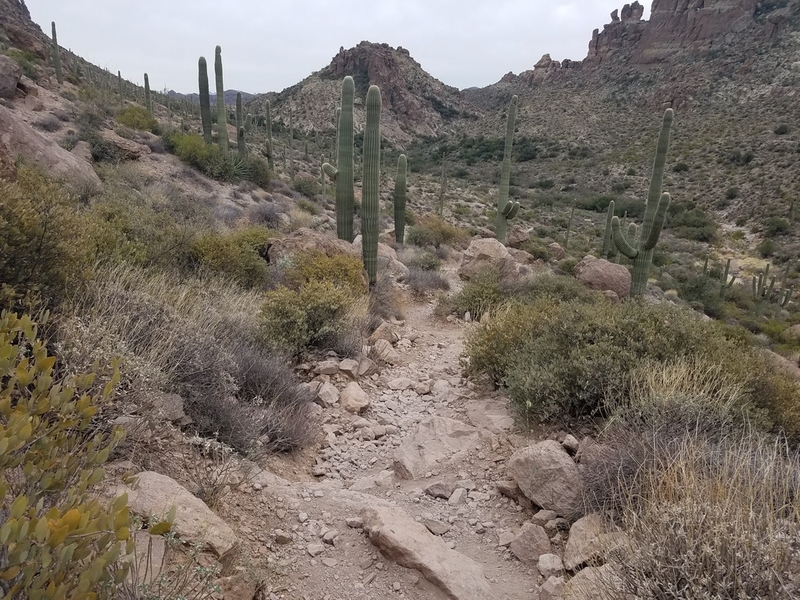 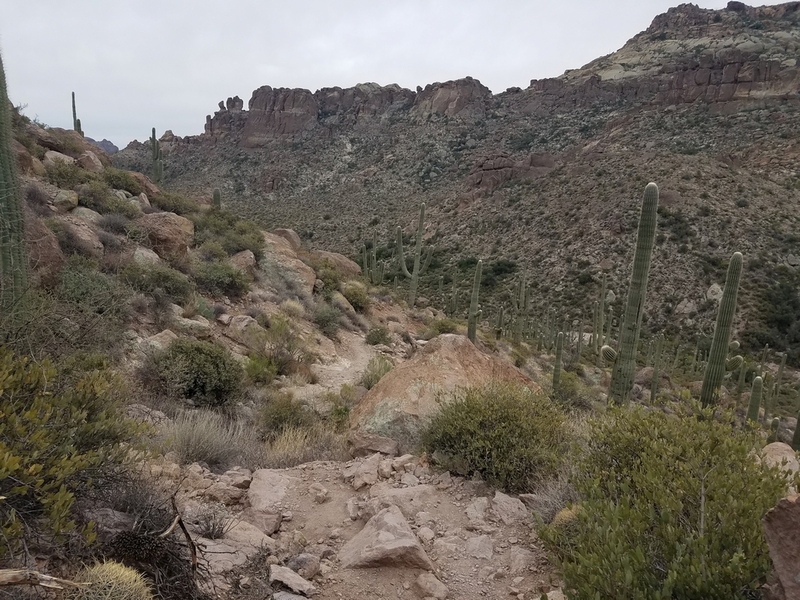 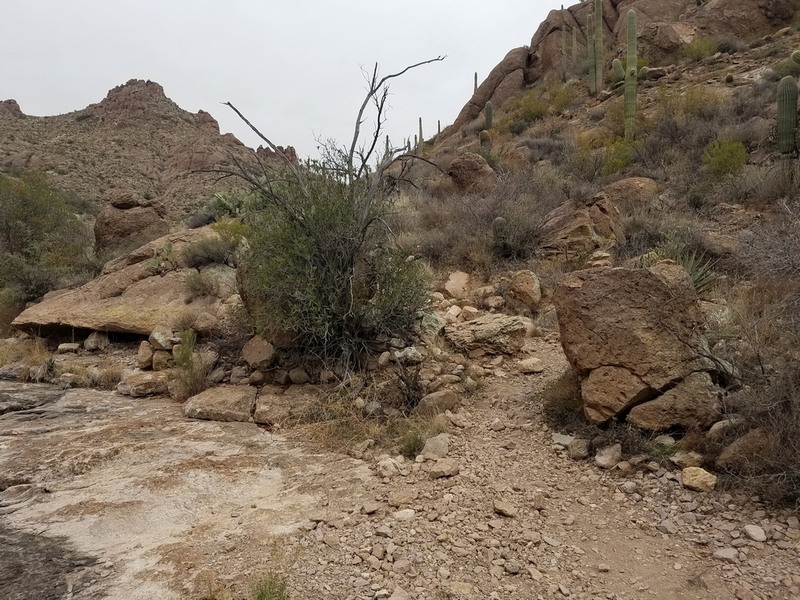 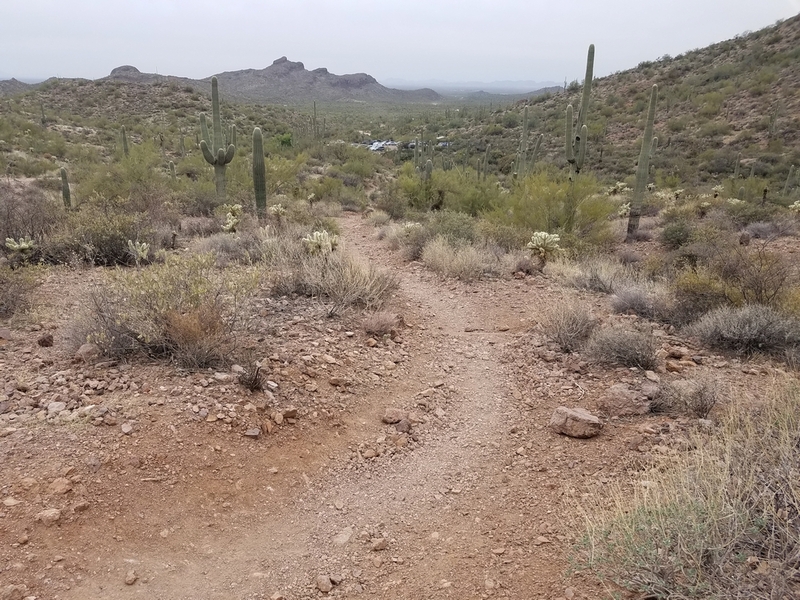 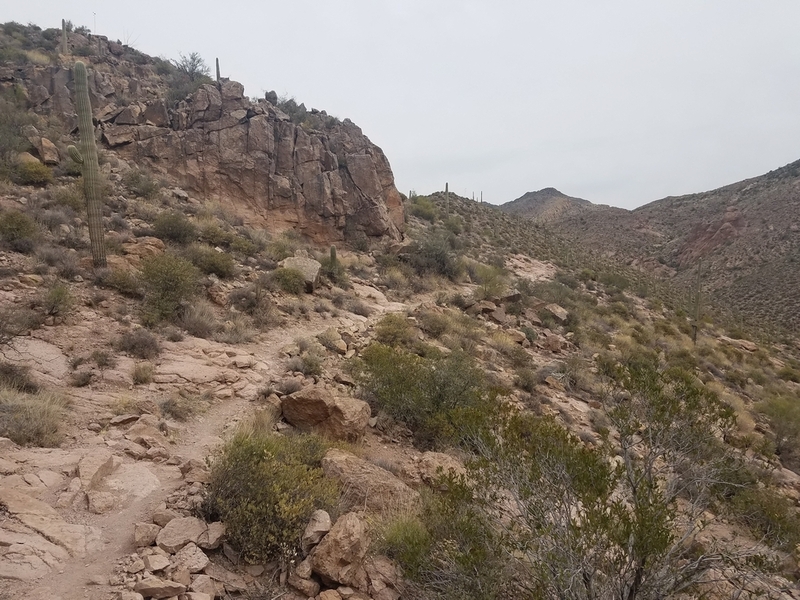 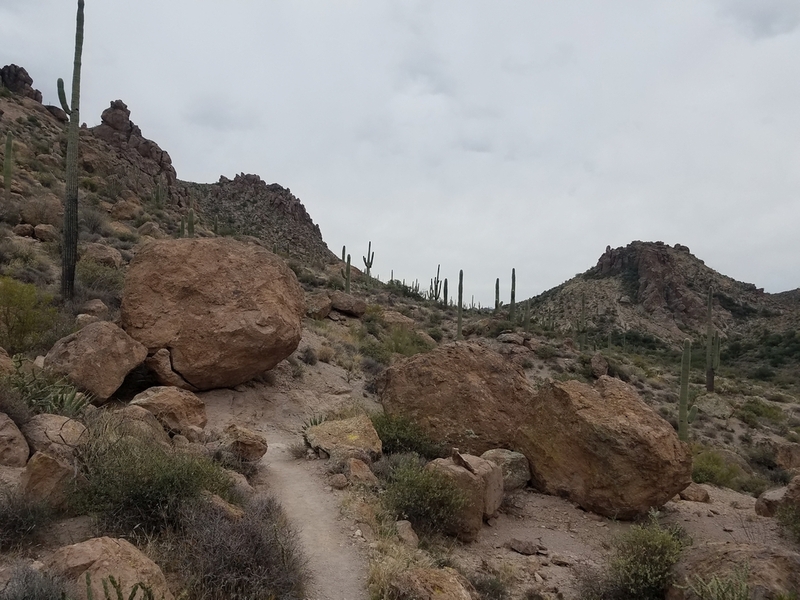 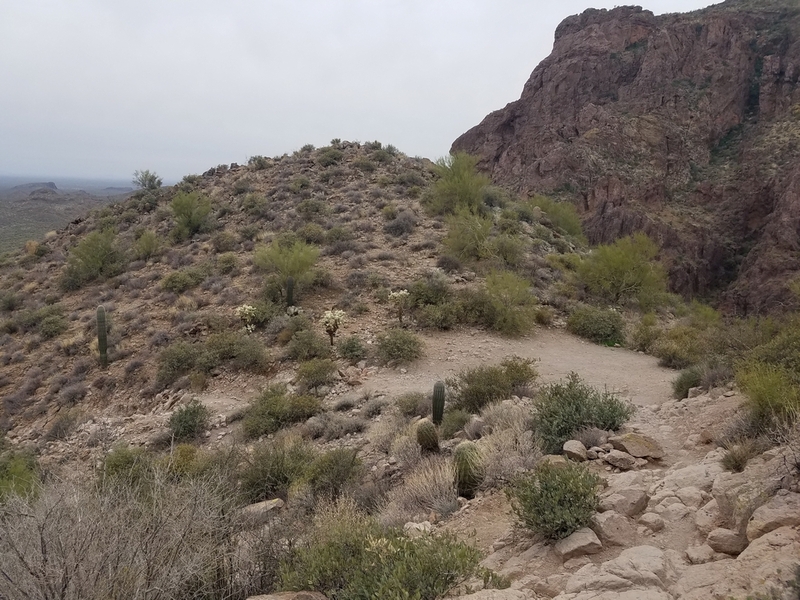 You can do this hike clockwise or counterclockwise, however when you go counterclockwise you have a more gradual climb up followed by a steep descent back to the trailhead. 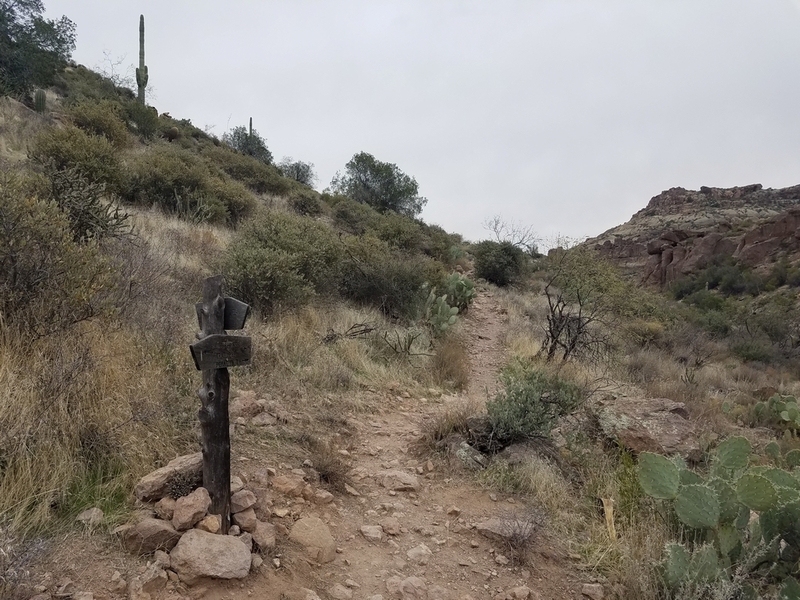 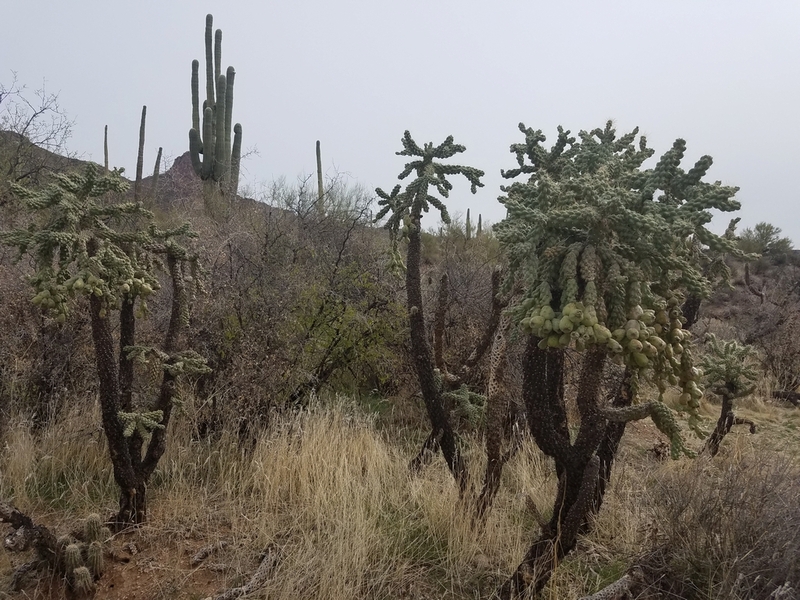 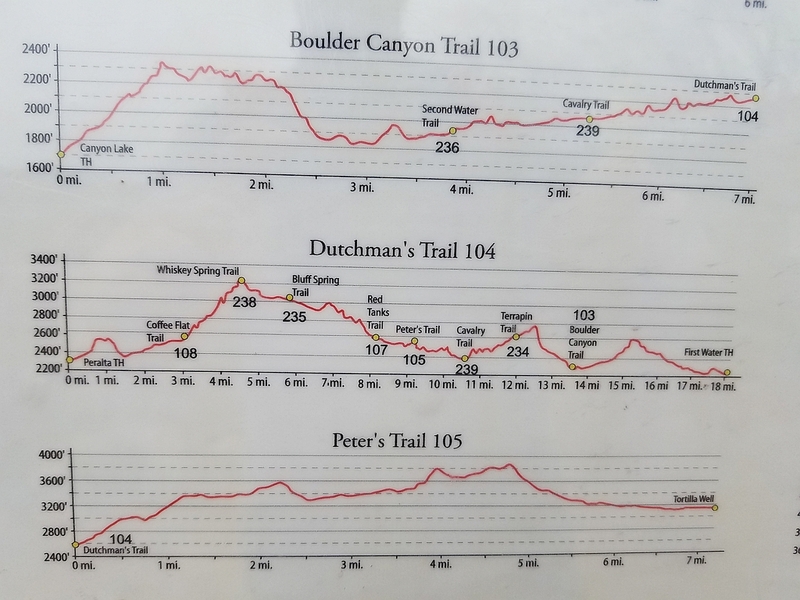 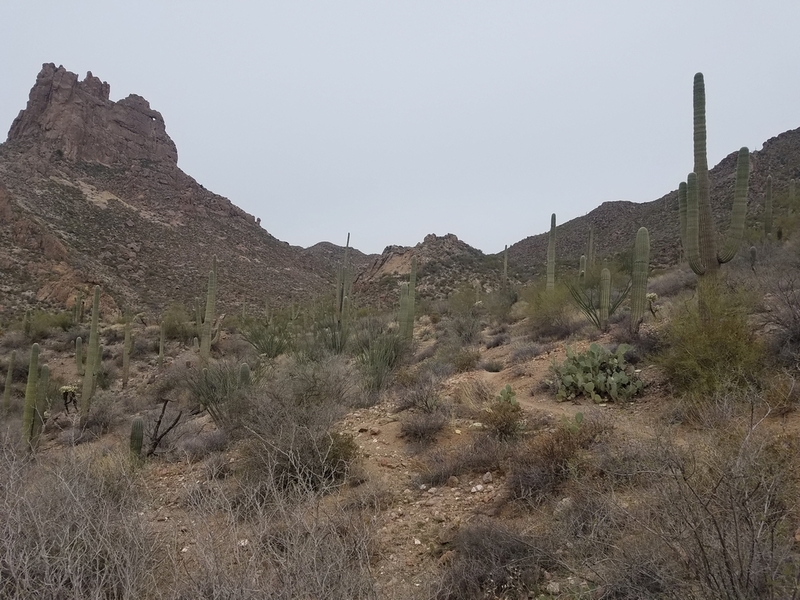 From the Peralta trailhead, head out east following the Dutchman’s Trail #104. 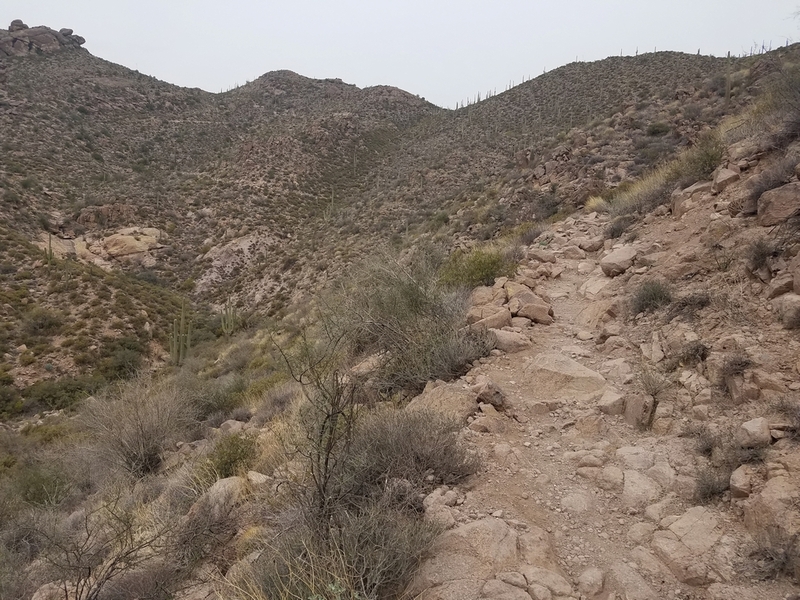 After passing the beginning hills the trail drops down into Barkley Basin. 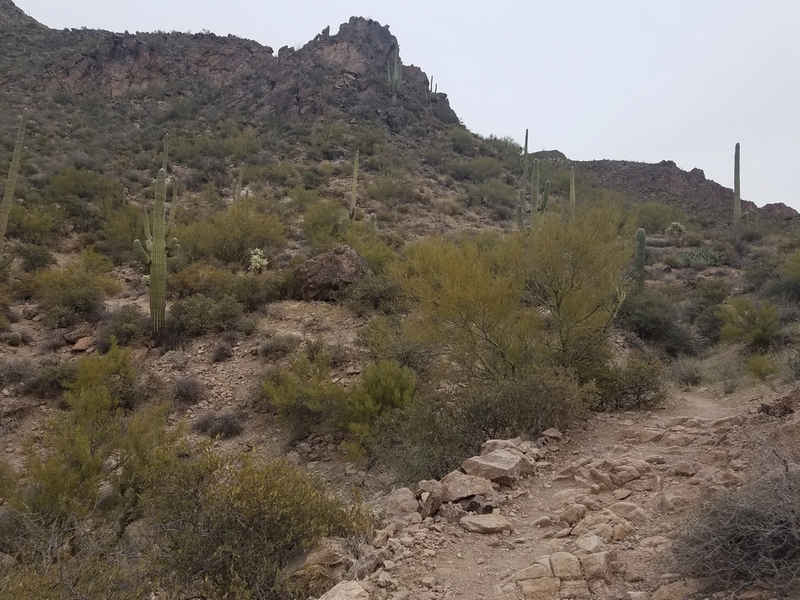 It’s a scenic hike across. 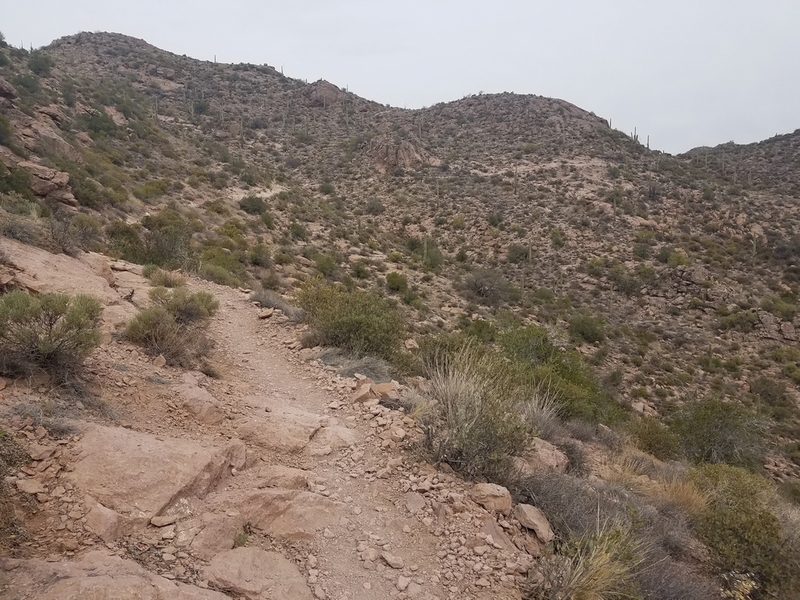 Passing the junction with Coffee Flat Trail #108, Dutchman’s Trail starts to switchback and climb. 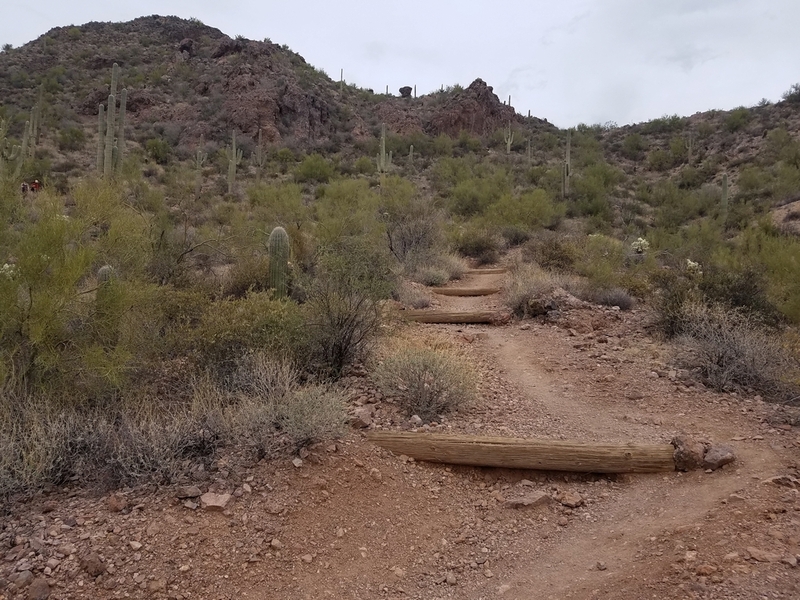 Once you make it through the five or six switchbacks you start heading northwest. 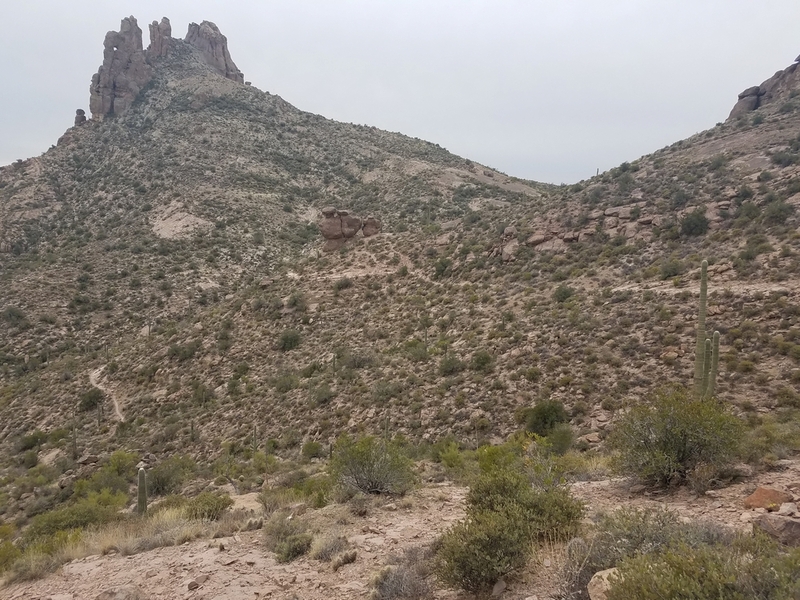 Soon you will pass the right (east) side of Miners Needle. 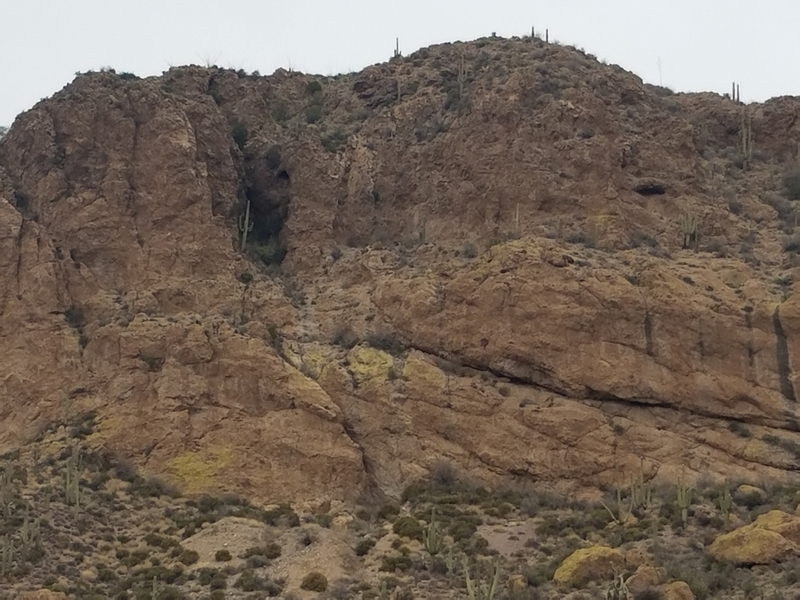 Passing the north end (keep looking up) you have a great view through the “eye of the needle”. 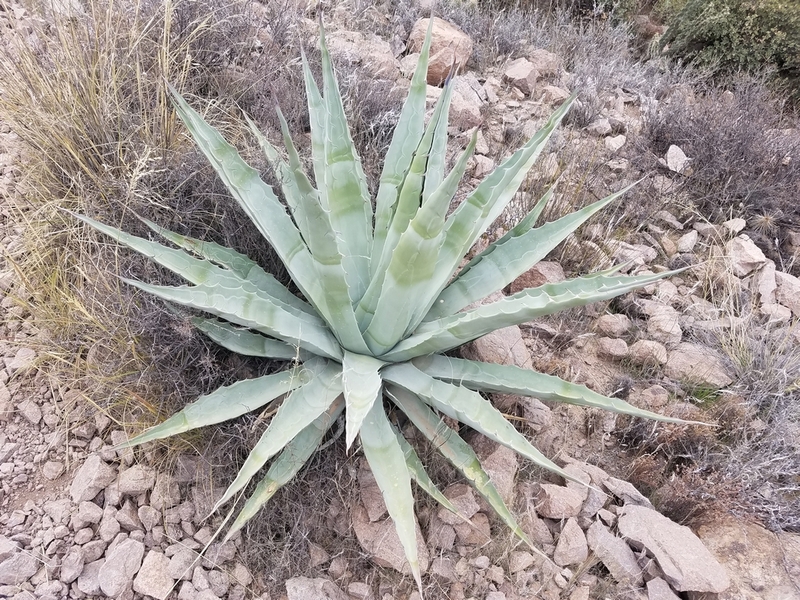 The eye is small so don’t get too excited. 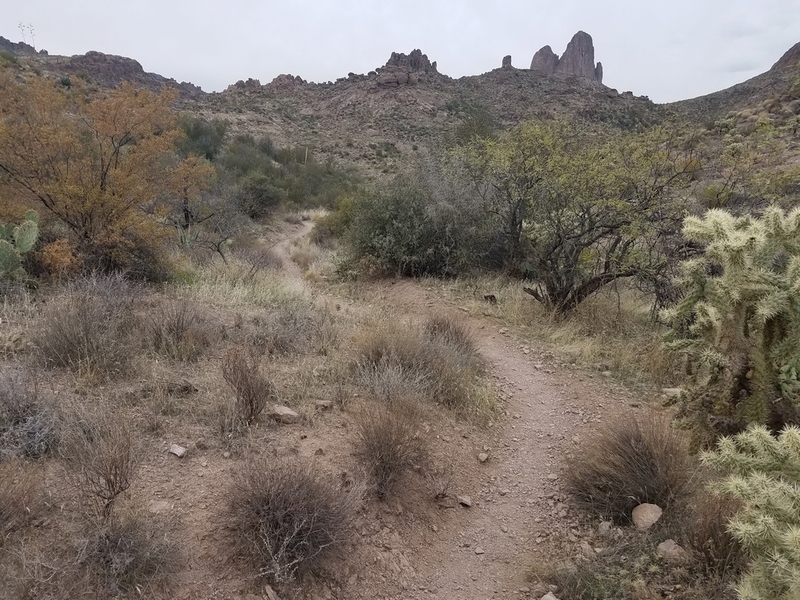 The trail makes a quarter circle around Miners Needle then heads north again. 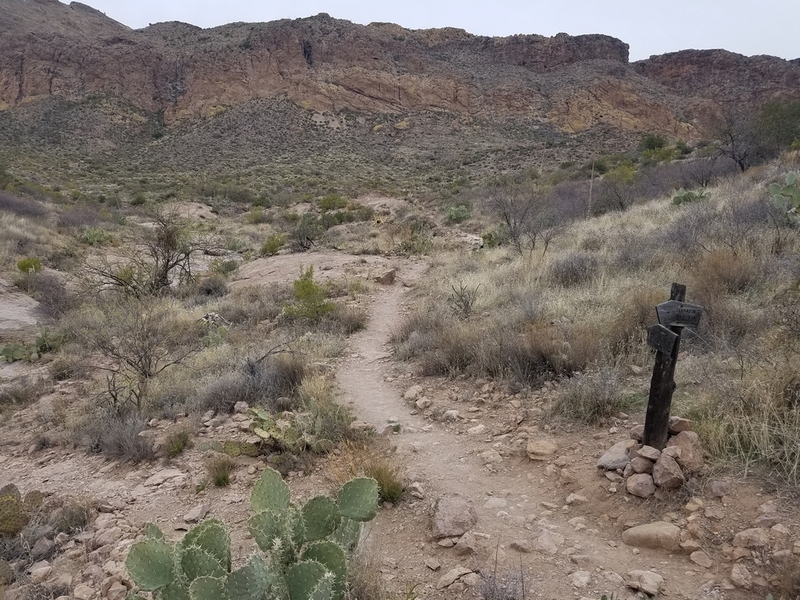 Shortly you come to the junction with Whiskey Spring Trail #238 at about four and a quarter miles. 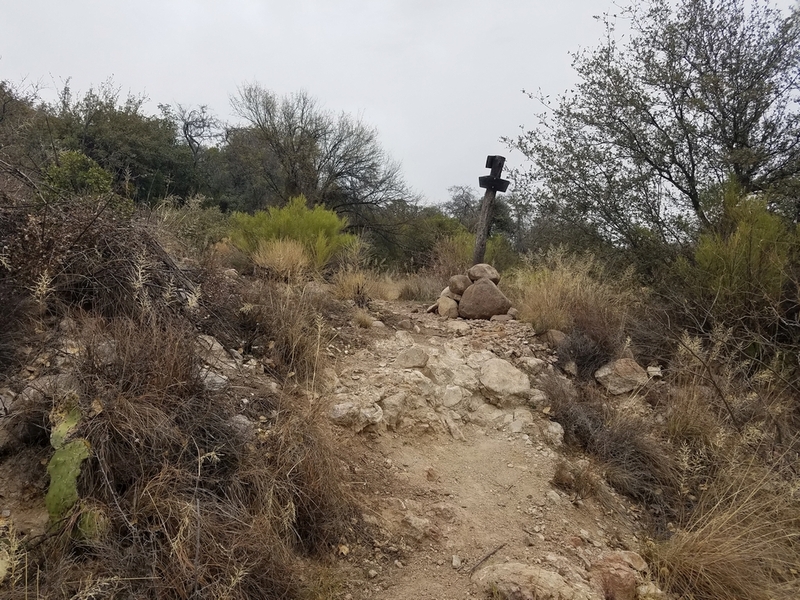 Continue on the Dutchman’s Trail down to its intersection with Bluff Spring Trail #235 at seasonal Crystal Spring. 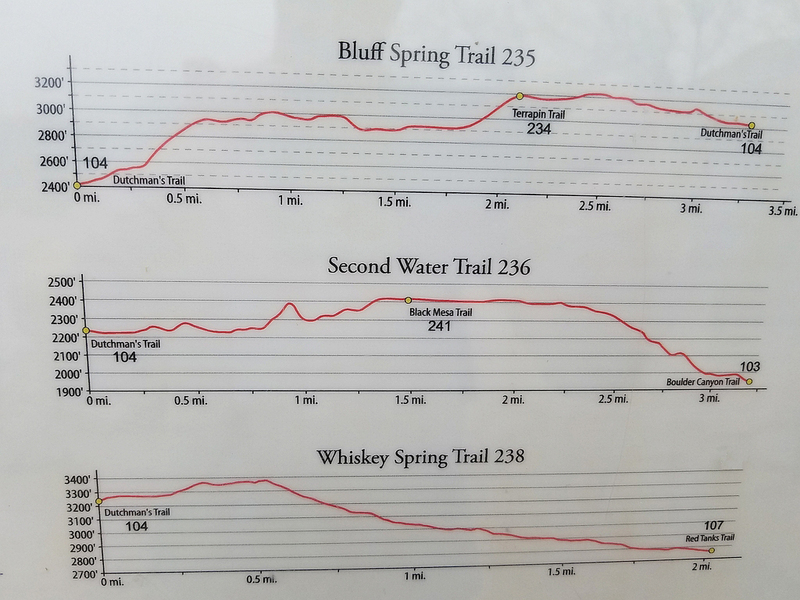 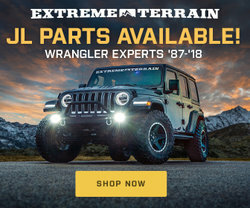 Take Bluff Spring Trail west to the junction with Terrapin Trail #234. 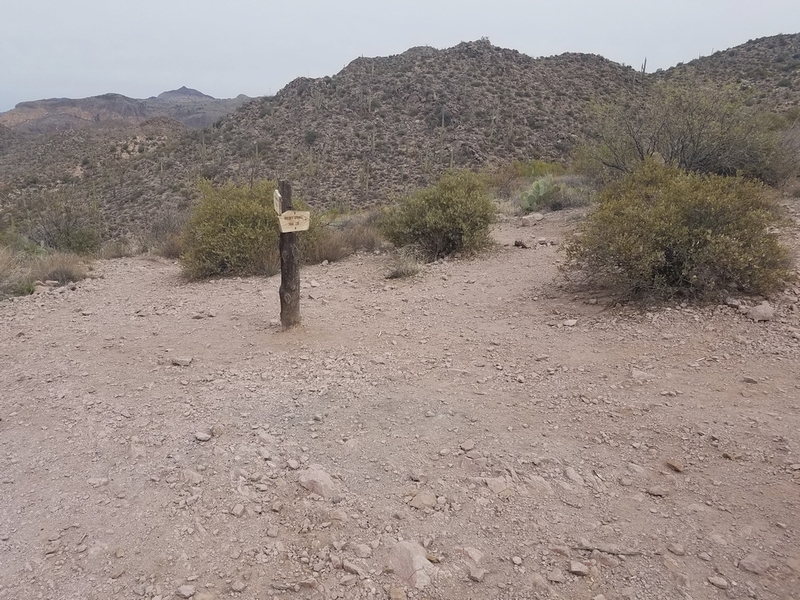 To complete Miners Needle Loop, head back by continuing on the Bluff Spring Trail to the trailhead and parking lot, which is 2.3 miles away from this trail intersection.